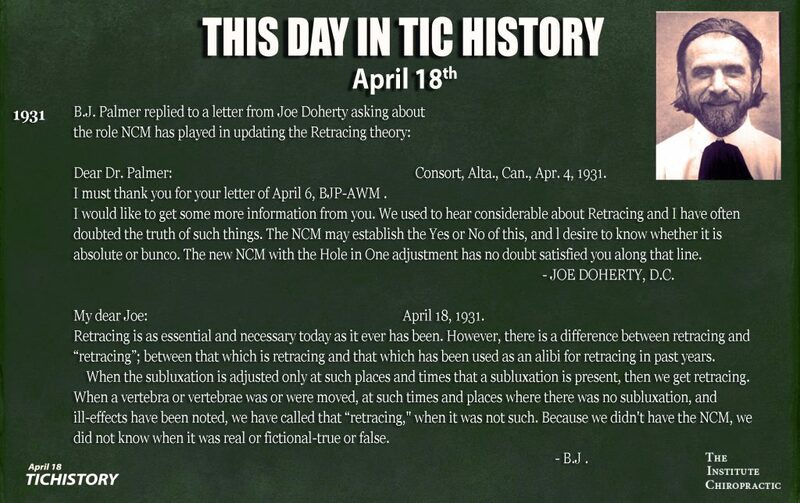 On his 61st birthday, on March 6, 1906, D.D. Palmer gifted Shegetaro Morikubo with chiropractic. He presented Morikubo with a bound edition of The Chiropractor’s first year of issues. As noted in our book, Palmer Chiropractic Green Books: The Definitive Guide, this included the only KNOWN inscribed book from the founder of chiropractic. But what D.D. 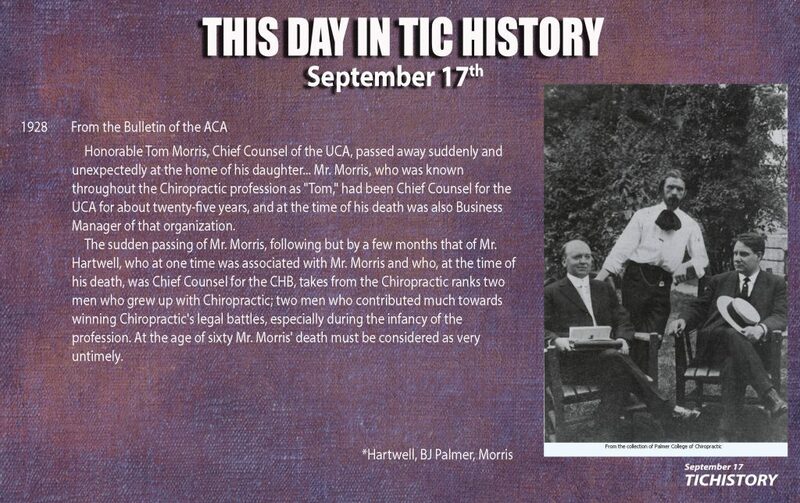 truly gifted to Mori was the philosophy and practice of chiropractic. *In 1910, D.D. Palmer wrote that March 7, was his birthday. O.G. 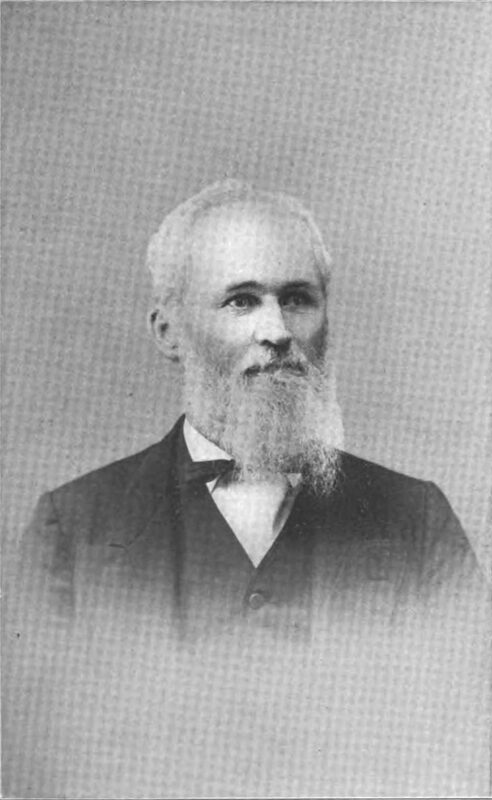 Smith was one of the first ten students. According to Faulkner’s excellent book, Smith was with D.D. for about six years in Davenport, Santa Barbara, and Chicago. A.P. Davis was one of the first students but he also spent time with D.D. years later in Portland, Oregon. C.S. 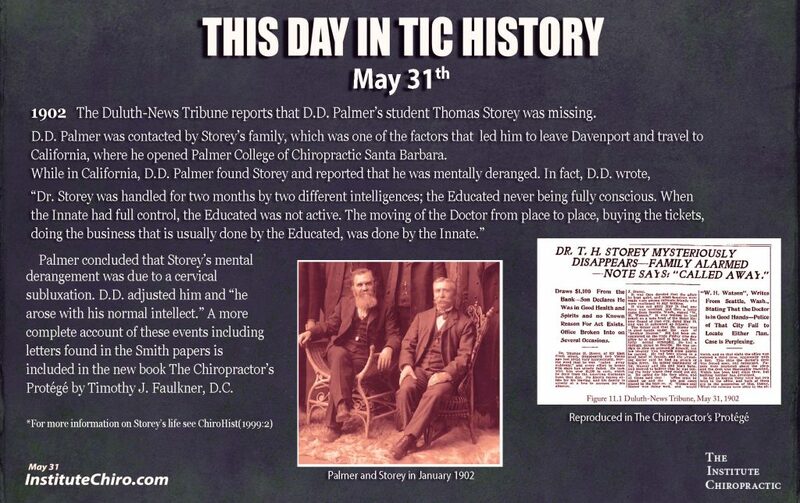 Cooley was one of the only students enrolled under D.D. during his three months of teaching at the Palmer-Gregory School in Oklahoma. T.F. Ratledge, who also spent time with D.D. 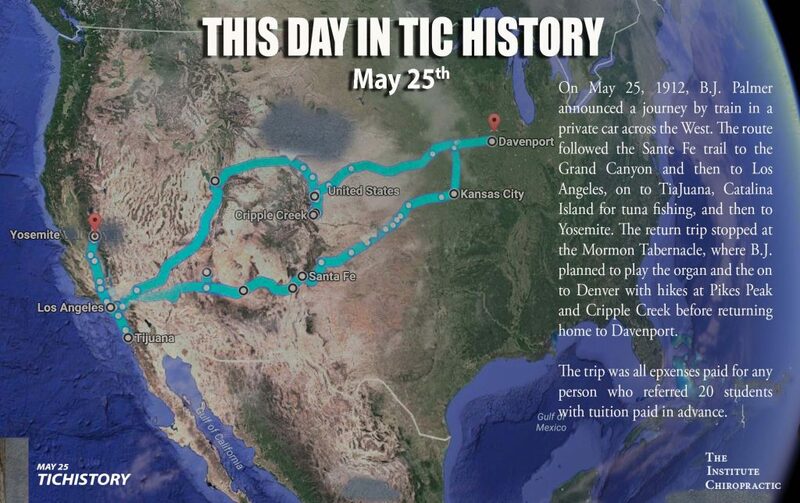 in Oklahoma went on to provide D.D. with his final teaching job at his Ratledge School in California. J.R. Drain attended D.D. 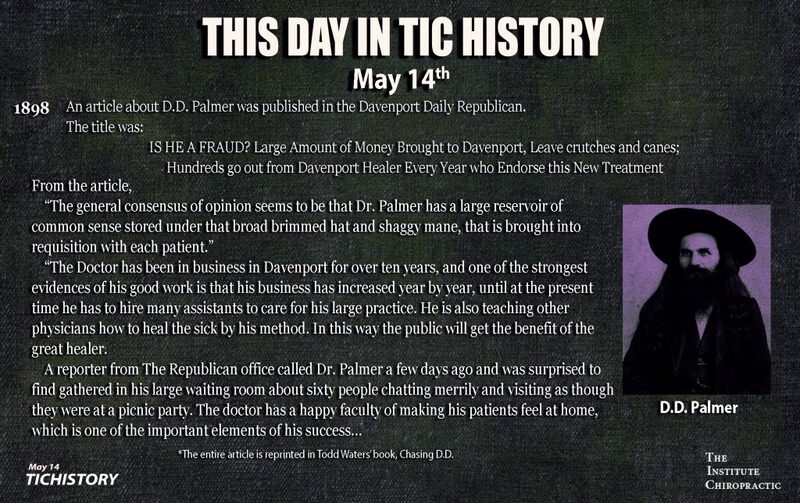 Palmer’s final lecture tour through Davenport in 1913, just before he died. And then there was B.J. Palmer, who carried on his father’s paradigm well into the twentieth century, without whom the profession would not have fully emerged. Unlike those other early pioneers who led schools and political organizations, Morikubo was unique. 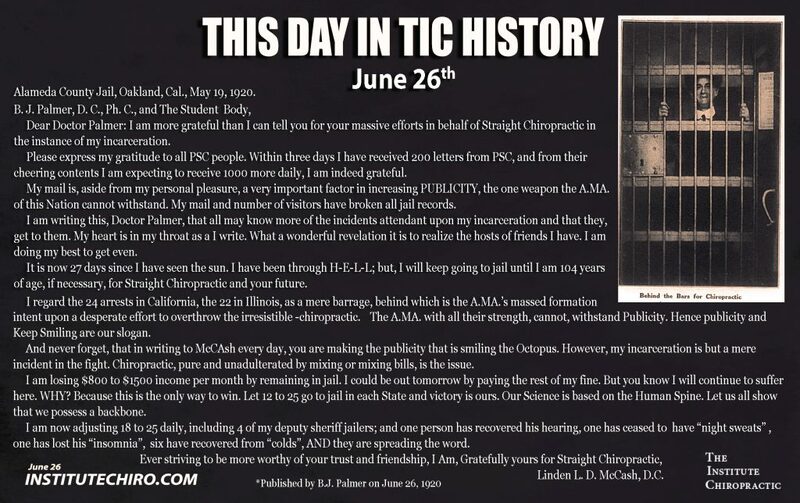 While he was an early leader of the Universal Chiropractor’s Association and he did briefly advertise an Academy in Minnesota, he is best known as a political activist. Soon after Morikubo received a life-changing chiropractic adjustment from D.D. Palmer, signed up as his student, and was presented with this text, D.D. 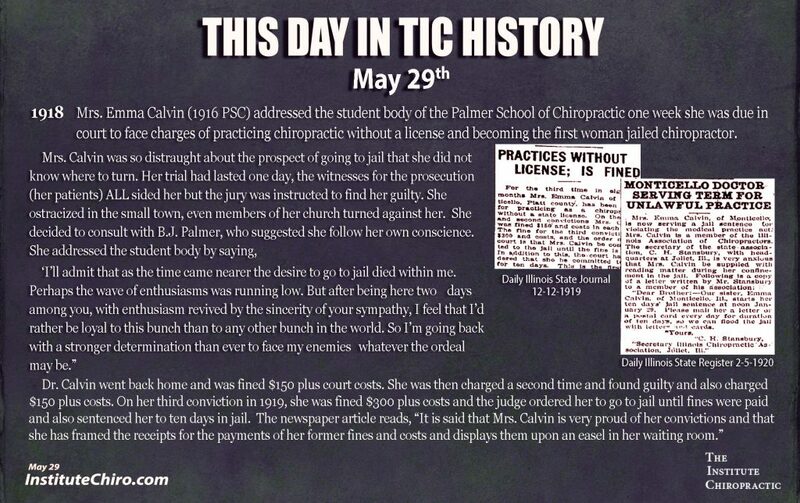 Palmer was jailed for advertising to “cure” in The Chiropractor. The day after D.D. 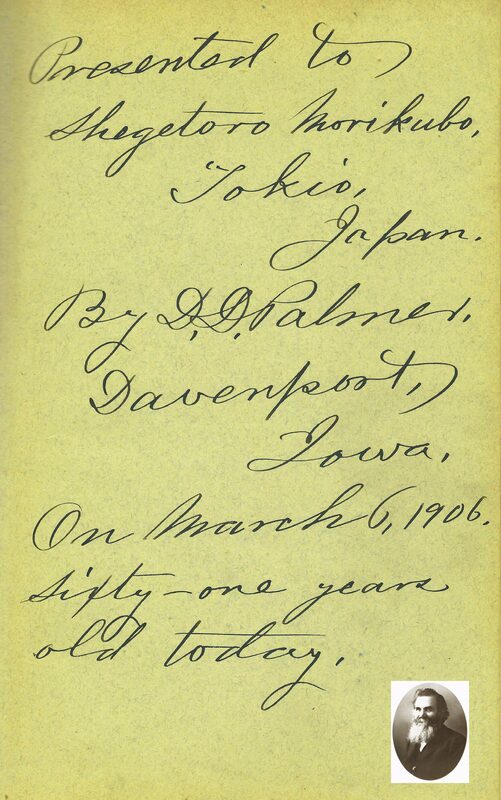 was sent to jail on March 29, 1906, Morikubo published a rebuke to the people of Iowa and America. He criticized a country that stood for ideals of liberty and freedom yet jailed an innocent healer for proclaiming his results. After leaving jail, D.D. Palmer moved to Oklahoma. Morikubo continued to study with B.J. Palmer until his graduation on December 22, 1906. Soon after graduation, he moved to LaCrosse, Wisconsin, which was the legal hot spot in the battle to legalize chiropractic. Morikubo moved there to force the issue. Morikubo opened his office in the Macmillan building, which was where A.U. Jorris, DO, practiced. This was a direct challenge to the state board. 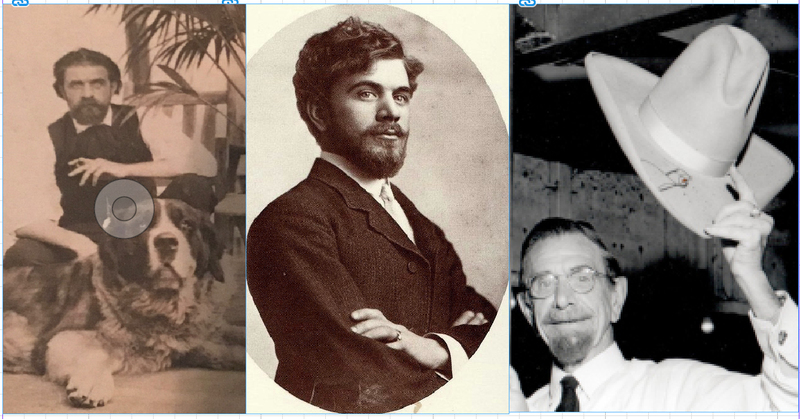 Jorris was on the board and was renown in osteopathic circles for his successful legal case against two psuedo-chiropractors in 1905 and 1906. By May, he had successfully cared for 70 patients. 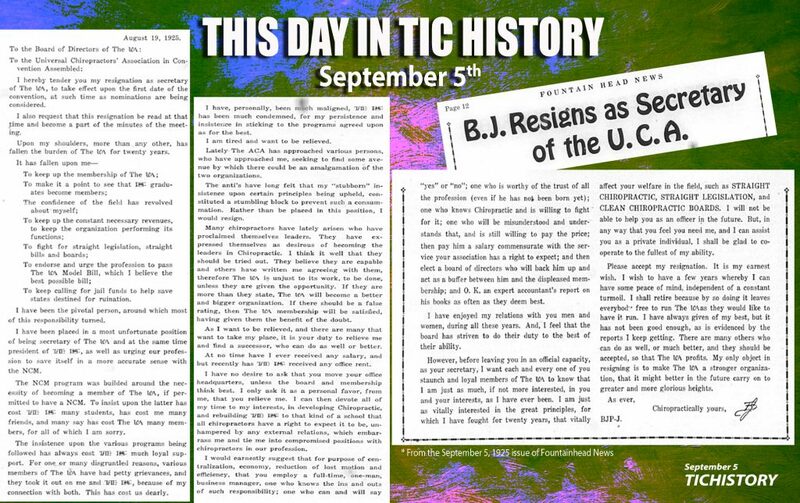 The case reports that he sent back to B.J. 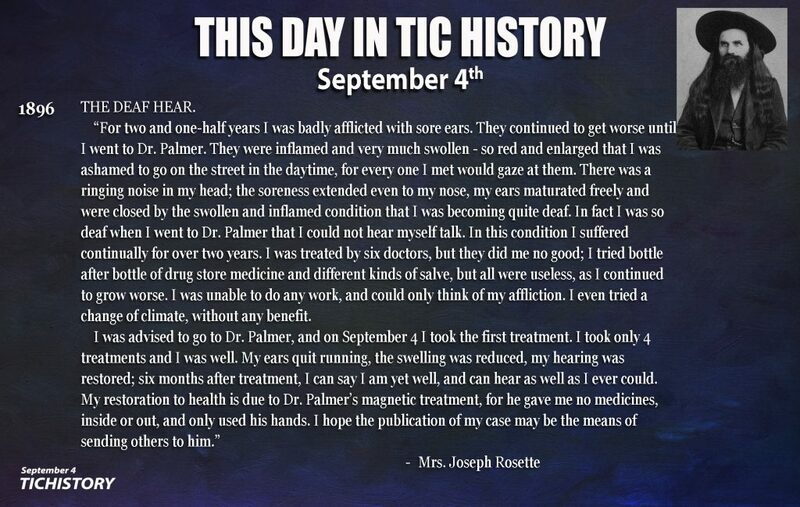 Palmer were characteristic of the range of disease processes typically seen by chiropractors. 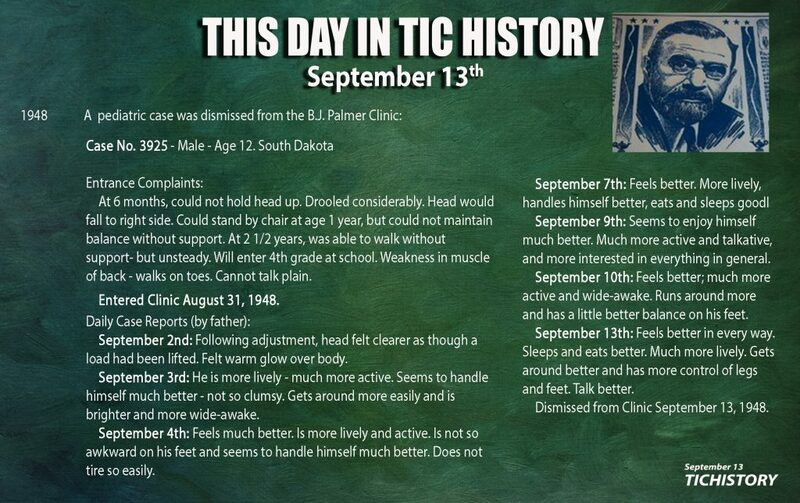 Chiropractic was born from medical failures. Cases ranged from 1 visit to four months. Some other cases he took note of included a 49-year-old male with pulmonary tuberculosis, a 50-year-old female with “suspicious sputum,” and a 20-year-old male with “rheumatism,” with a paralyzed left arm, left facial paralysis, and full body convulsions. Examination of that last case “found a big axis sub-luxation.” Morikubo writes, “The patient drew up as straight as a pine tree: whirled around the left arm like a windmill and walked out of my office, like a hurricane.” The patient returned the next day “angry” because his cure was too quick. In July 1907, the board filed a complaint against Morikubo. The landmark trial took place in August. 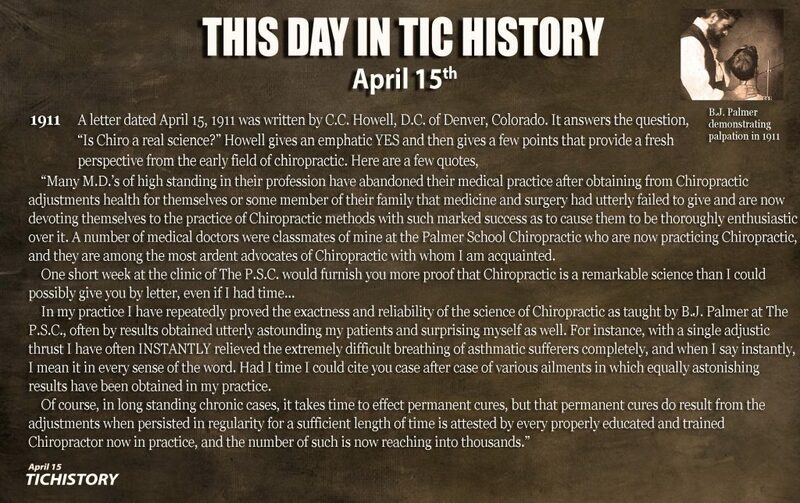 The case demonstrated that chiropractic was a distinct profession with a science, art, and philosophy. Morikubo’s story is just one example of the many pioneers that D.D. 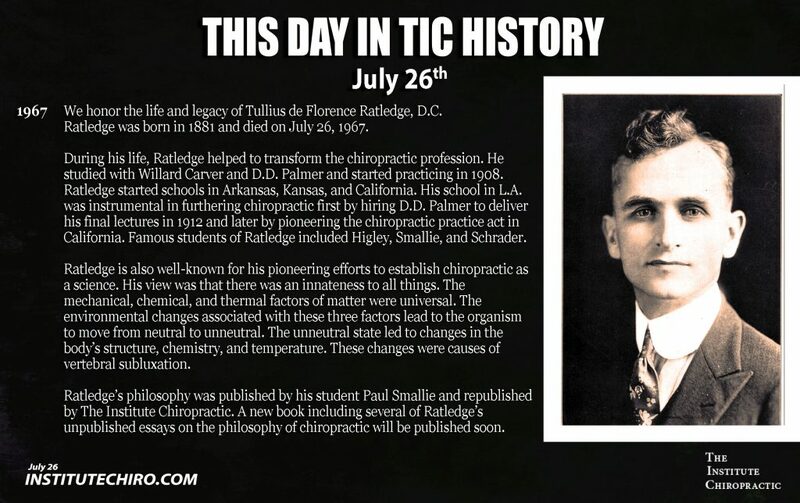 Palmer inspired with his magnetic personality, his mastery of chiropractic, and ability to teach others what he knew. The ripples of his gifts are still with us today and yet the significance of their contributions is fading from the collective memory of the profession. This is contributing to the many challenges the profession faces. Join The Institute Chiropractic and master the three chiropractic paradigms. We are at a critical time in the chiropractic profession. A small minority in the profession have used their positions of power in academia, regulatory boards, and as journal editors and authors to try to move the profession away from its central defining feature, the analysis and correction of vertebral subluxation. This type of lexicon cleansing has been well documented. Not only do we need more articles in the literature documenting the correction and assessment of vertebral subluxation but we also need articles demonstrating the reality that vertebral subluxation continues to be the core of the profession. The latest article by Dr. Dave Russell is a must read for the chiropractic profession as it establishes the current state of the profession in relation to vertebral subluxation. This includes insights about what still needs to be researched. The article, The Assessment and Correction of Vertebral Subluxation is Central to Chiropractic Practice: Is there a Gap in the Clinical Evidence? was published in the latest issue of The Journal of Contemporary Chiropractic. There are commonly use indirect or remote assessments that suggest vertebral subluxation causes alteration in biomechanical and neurological function, but don’t necessarily identify where and in what direction to deliver a chiropractic adjustment. These are reported on in the literature and important. Of primary interest in this study are direct indicators of vertebral subluxation, which include tenderness, soft tissue palpation, intersegmental motion palpation, joint play/end feel, leg-length inequality, and special tests including cervical syndrome, Derifield and heel tension, are commonly used in clinical practice, both as generic indicators or as part of specific technique protocols, are used in daily clinical practice to directly determine the site and direction to apply the chiropractic adjustment, and are consistent with the biomechanical and neurological attributes of a vertebral subluxation common to all models. Clinical evidence does not seem to reflect the core objective of vertebral subluxation assessment AND reduction/correction. In a review of all clinically oriented studies in chiropractic journals (2017) 70.2% described the assessment of vertebral subluxation using at least one of these indicators. In stark contrast, only 15.4% of the same studies documented a reduction, correction or “elimination” of vertebral subluxation based on the direct indicators documented after a period of care or a clinical trial. Chiropractors in clinical practice, chiropractic clinical educators and chiropractic researchers could address this potential gap in the evidence by documenting the commonly used direct indicators of vertebral subluxation in the initiation of care or a clinical trial and at each progress evaluation or post the completion of clinical trial outcome measurements. Dr. Russell completed an in-depth survey of the literature including 199 references. The profession should study this paper and the references. Perhaps then we might begin to move forward with a more complete view of the profession and push back against the inaccurate portrayals about vertebral subluxation espoused from the fringes of the profession. 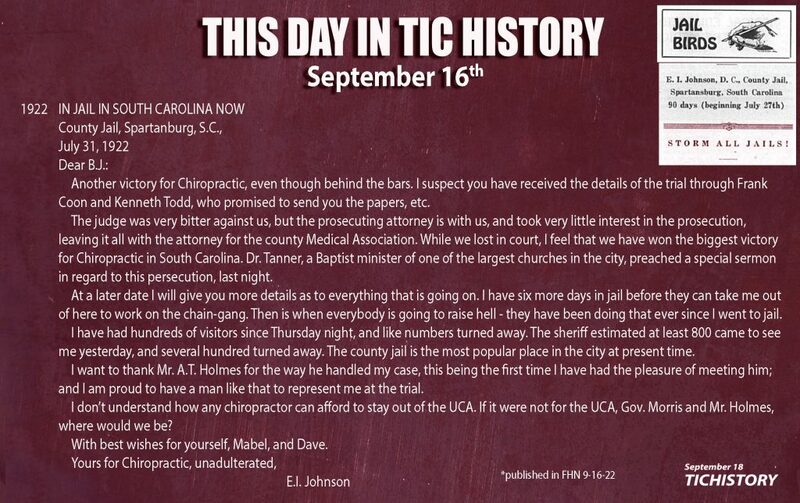 I wrote about my chiropractic legacy on my birthday last year. In that post, I reviewed the latest courses, TIC, some background about my previous writings, and an overview of my latest insights. I did not include the publications that were in the works or the newest research. It is amazing how a legacy can be multiplied in just one year! This year truly marks a transformation for the chiropractic profession. I don’t say this lightly. The new book I just published with Timothy Faulkner and Joseph Foley is groundbreaking. 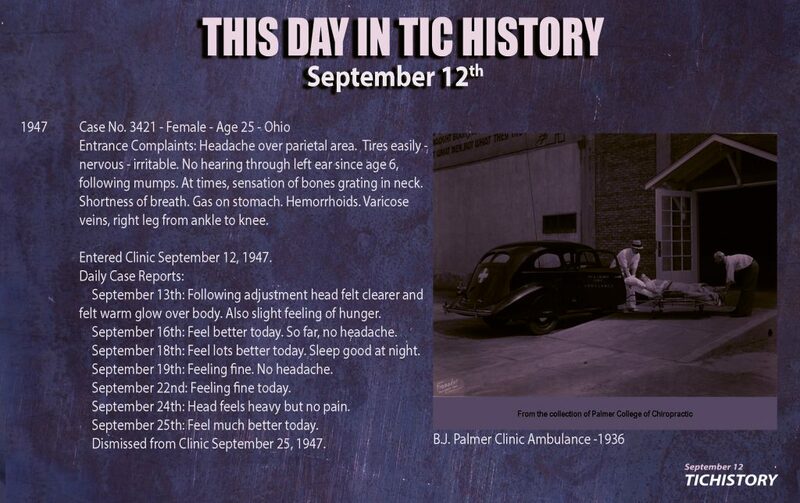 It is the first time the profession might collectively understand The Palmer Chiropractic Green Books. So much is written about these books that is either derogatory or laudatory. Rarely do we get a dispassionate examination of the books. What is in them? Why are they still relevant to practicing chiropractors? What is the point of reading them? The book is a legacy. Also, in last year’s post, I did not mention the TEN new papers. We are now weeks away from publication. I am pleased to announce that they are coming soon. The papers will be published in the Journal of Chiropractic Humanities. They are in the final stage of layout and design. 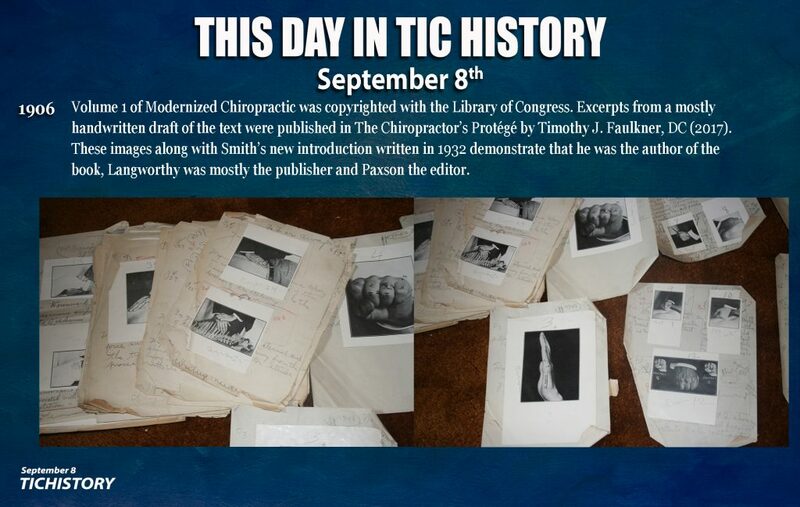 The topic is The Chiropractic Vertebral Subluxation from 1897-1997. I will do a series of blog posts about these papers and the courses they will inspire in the coming weeks. Finally, the latest research is really powerful. Last year I started my PhD studies at the School of Health and Human Sciences at Southern Cross University. As I develop this research, I post regular lectures for TIC Members. It is a fascinating project and will surely impact the chiropractic profession (and other professions) for decades to come. I am forever thankful to the Foundation for Vertebral Subluxation for the opportunity. As this 48th year of my life unfolds, I look forward to the many ways my legacy in the chiropractic profession will continue. I already have plans to present a keynote address and a workshop at BCC Lyceum and a 12-hour seminar in Paris. Two new sets of online lectures are being developed. I am open to where this goes next! Thank you for your continued support whether you are a reader, a TIC Member, a student, or a colleague (or all of these). 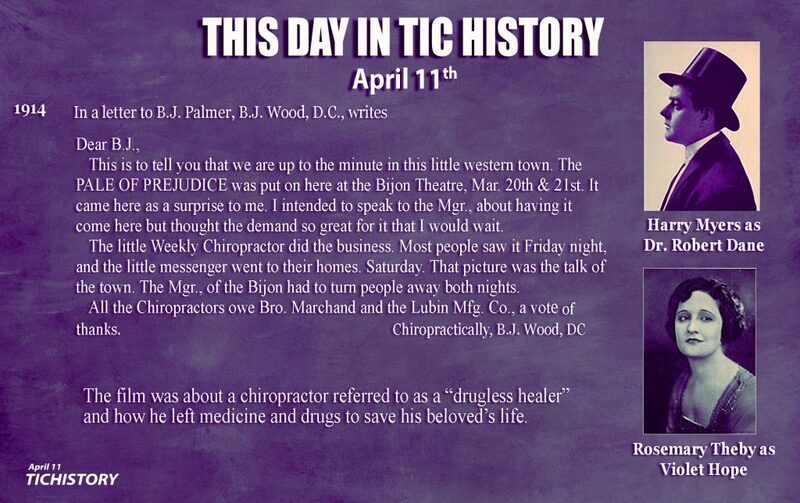 I am continually amazed by the bias exhibited by chiropractors against B.J. Palmer. It rarely seems to stem from a critical analysis of the literature. More often it seems like a meme that was passed down from teacher to student or from author to reader. This short clip is from a longer Skype lecture that I gave to a chiropractic school class. In the clip, I just mention this weird phenomenon. At the end of the clip, I added one solution to remedying this problem. The solution is simple – read the new book Palmer Chiropractic Green Books: The Definitive Guide. Just to be clear, I did not try to sell the book to chiropractic students. I am more interested in teaching facts to students. They always need more historical facts. I did plug it here because after cutting this clip from the larger lecture I realized the simple solution to this problem. I know it may seem like I am putting B.J. Palmer up on a pedestal. After all, that is how the traditional bias is portrayed. Anyone who seems to embrace the ideas or theories espoused by B.J. are often criticized in some way. This is how bias generally works. Groups of people are clumped together as if they all believe the same thing without a critical or – dare I say – evidence based attempt at understanding. B.J. Palmer was a controversial figure. He created enemies and followers. One example is from his classic talk, Cleaning the House. 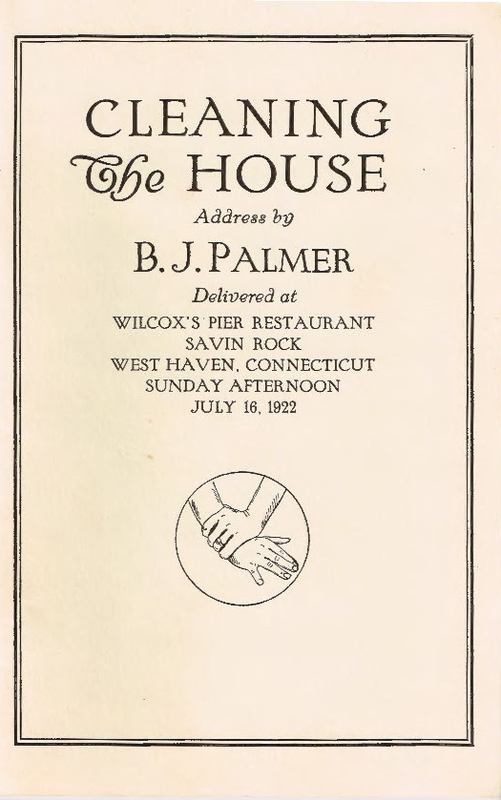 It was delivered on July 16, 1922, at Wilcox’s Pier Restaurant, Savin Rock, in West Haven, Connecticut. During the talk, B.J. laid out the new UCA policy to take over state boards throughout the United States and push for the model legislation. The UCA legislation was designed to ensure that chiropractic was solely defined as the analysis and correction of vertebral subluxation. This approach went against those in the profession who sought to expand chiropractic beyond its traditional boundaries. Those once referred to as “mixers” because they mixed chiropractic with various therapeutic modalities and even included other professions in their practice of chiropractic. He also attacked several heads of chiropractic colleges. 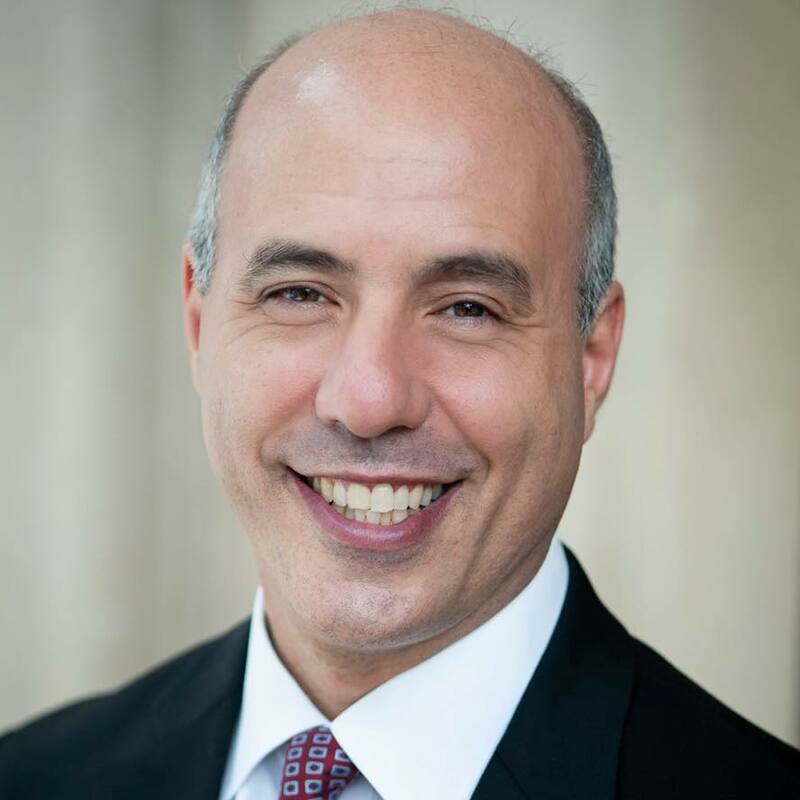 For example, he attacked Loban, head of Universal Chiropractic College, Carver, head of the Carver Chiropractic College, Forster, one of the leaders of National Chiropractic College, and Collins, head of Mecca College of Chiropractic. Think about how these attacks may have caused ripples throughout the decades. Students at these schools became the next wave of leaders in the profession. The students of their students are probably still in places of power throughout the profession, teaching, publishing, administrating, and establishing policies. Basically, when I hear people shout negative things on social media about B.J. Palmer, I generally assume their teacher’s teacher’s teacher knew someone who had a disagreement with B.J. I rarely assume the person is well informed on the three types of chiropractic paradigms and the literature that supports them. Hopefully, they are. Part one of the fifty-minute talk is available for TIC Members here: B.J. Palmer’s Evolution. In the talk, I explore the important facts that there are several different biases against B.J. Palmer. Some of these arise from D.D. Palmer’s writings (those need to be critically analyzed). Other biases involve misunderstandings about various aspects of B.J. 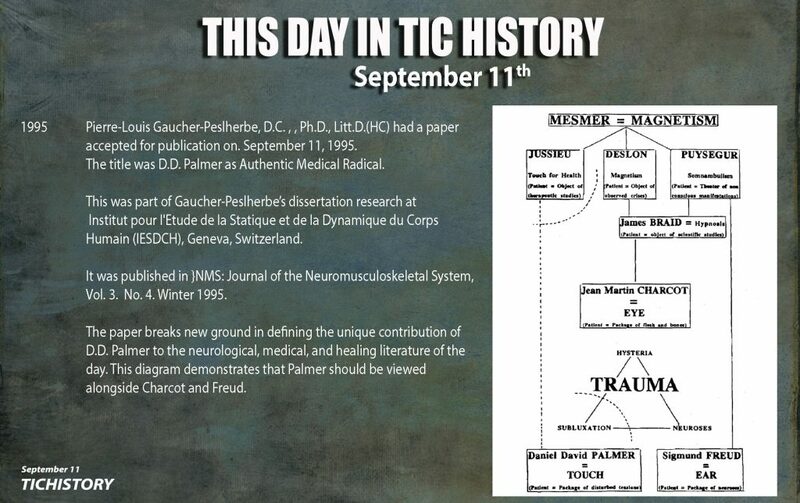 Palmer’s theories such as the development of his upper cervical model of chiropractic. 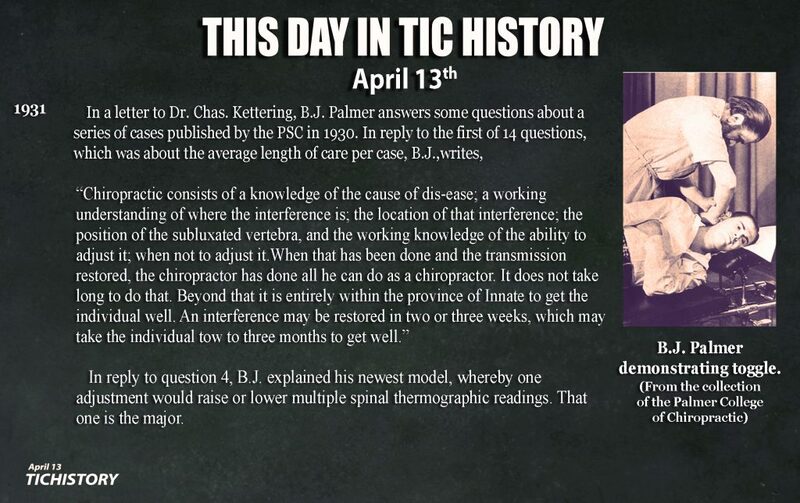 There is also the decades of chiropractors that just accepted B.J. Palmer’s ideas. Some of whom studied his research and theories. Others may have just accepted the ideas on authority. This is not an excuse to lump all modern chiropractors into that category. The Definitive Guide is a powerful way for the entire profession to learn the same basic content about the chiropractic paradigm, the Palmer Green Books, the evolution of the ideas, the decades of research, and interesting aspects of history. Many of the biases against B.J. Palmer will naturally dissipate as more and more chiropractors learn these facts. The first shipments of Palmer Chiropractic Green Books: The Definitive Guide by Timothy Faulkner, Joseph Foley, and Simon Senzon are beginning to arrive worldwide. The first one was received by Donald McDowall, DC, DNBCE, DIBAK, MAppSc, author of the book’s Foreword. Here is a picture of the chiropractic historian himself with the newest textbook for his incredible collection. The Foreword is posted below. 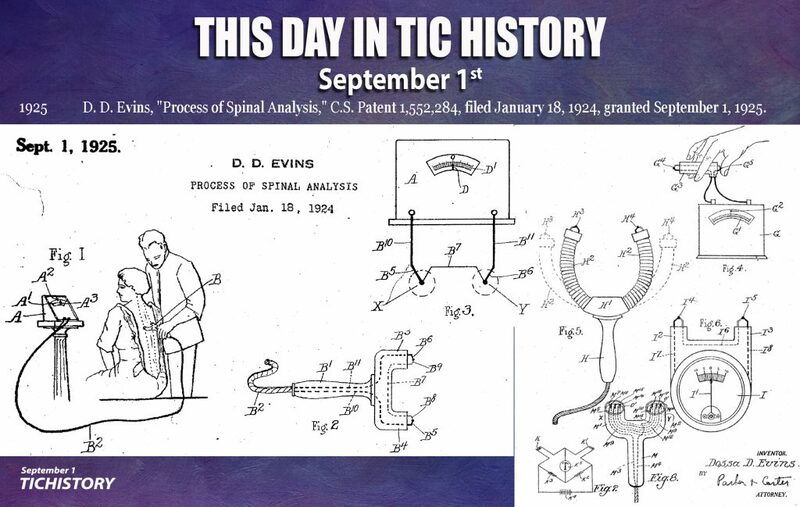 We have also posted the Contents, the Introduction, and the review from Chiropractic History. The Definitive Guide is already reshaping the discourse in the chiropractic profession. I have known two of the authors, Faulkner and Foley, since the early days of the Internet in the 1990s. I have known Senzon for the past few years. My expertise as a collector of Green Books as well as a scholar of chiropractic’s early theories gives me a unique perspective on this book. Senzon’s analysis of the forty-four Green Books as described in Chapters Two through Fifteen is outstanding. As to Senzon’s overview, I recommend you take the time to study it carefully, read the references, and then study it again. It is the best introduction to the Green Books ever written. I would however like to provide more context for the important the work of Faulkner and Foley. The authors, chiropractors Dr. Joe Foley and Dr. Tim Faulkner were computer savvy, Internet addicts as well as chiropractic literature scavenging devotees who competed with me for some of the rare documents, books and memorabilia listed on the used bookstore networks and the Ebay auction website. 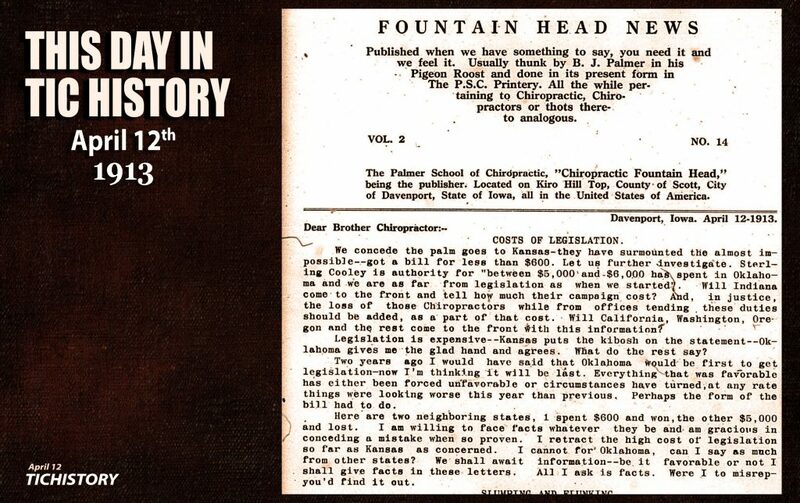 In those early days there were few sources for acquiring chiropractic literature and memorabilia outside of being gifted with a retiree chiropractor’s collection or purchasing an estate collection from advertisements. Many retired chiropractors simply packaged their collections and sent them to their Alma Mater for the library archives. Some padded their retirement funds and sold them to the highest or quickest Internet bidder. Much rare historical literature was destroyed when chiropractors passed away. These old books and relics of the early chiropractors became treasures for a few collectors like Foley, Faulkner and myself. However, the disadvantage I had in this competition to find chiropractic treasures, was where I lived. Canberra, Australia was a long way from where most chiropractors lived in the heartland of chiropractic, the good old USA. The other problem I had was the 14-hour time difference between Australia and the USA. Sometimes we would bid against each other over a book listing. Dr. Foley and I met battling each other on Ebay.com for a leather-bound edition of D.D. Palmer’s great 1910/11 tomes. Dr. Foley won that battle. However, I was able to win the 1904-1906 leather bound editions of The Chiropractor journal from the same collection. That was an interesting experience because the dealer only listed the first of the three volumes. When I won it, I telephoned the dealer and asked if she had any other items from the same collection that she had not yet listed for sale. She said there were two others and asked if I would like to purchase them as a group without them being listed on Ebay.com. Of course I said yes and was able to score the whole collection. I eventually found out they were a set of only six that B.J. Palmer ever bound and sold. As books they predated Modernized Chiropractic published in 1906 by Smith and Langworthy and The Science of Chiropractic by D.D. and B.J. Palmer, also in 1906. Collectors are often criticized for hoarding without sharing their know-ledge. This publication is a testament to both authors for giving of their knowledge of this very specialized collector’s niche. 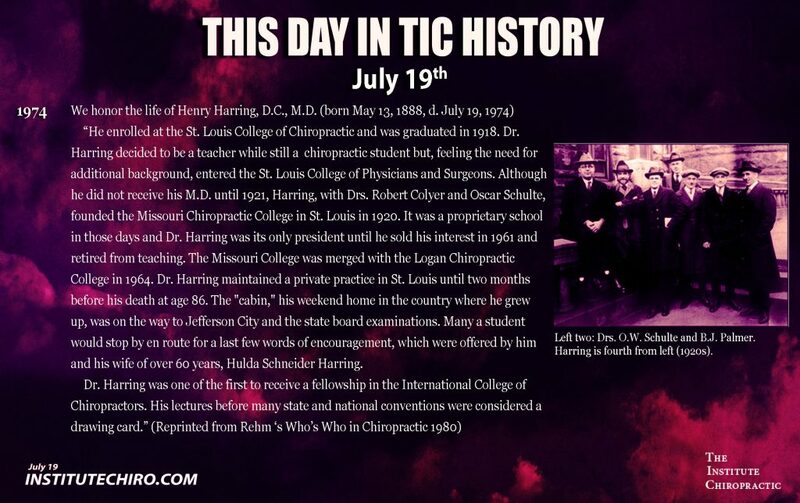 I have followed their research and papers published in the Association for the History of Chiropractic Journal with great interest, enjoying their adventures as they uncover the most unusual history of the chiropractic profession. This book focuses on identifying, grading and rating the Palmer Green Books published by the Palmer School and College of Chiropractic. The books were written from 1906 to 1961 and are generally identified by their green cloth covers. These books are important to chiropractors because they describe the history and challenges of the profession. Some describe the arguments and contentions that arose and were resolved or continued by the Palmers, others are texts that have gone through multiple prints and occasional additional editions. Knowing what books to look for and how to identify these original books from modern reprints is essential to gauge a reasonable price. The authors show you how to identify the characteristics of the original books and assess their condition. Some of these books may appear new and others will be so well used they are covered in notes, handed down to many generations of students until the covers fall off and the pages fragmenting. Over time some books became very hard to find. In fact, only 15 copies of D.D. Palmer’s original 1910 book are known to exist. There may be even less copies of his 1914 book. The variations in prices of these books are well described for the beginning collector. The book describes how to begin your collection and how to expand it. The Introduction describes Foley and Faulkner’s journey as collectors. Many of the documents and books are housed at the special collections section of the Palmer University Library, the mecca for chiropractors, where they can visit and see complete sets of the various editions of these famous books. This library also contains many original publications from before the beginning of the profession that may inspire you to broaden your collection. The book also includes an extensive collection of photographs of the books to best illustrate the variety of collections possible to achieve. Why go to this much trouble to collect the history of this unique profession? For many it will be a family heritage in the chiropractic profession, for others it will be the knowledge found in the books that may soon be lost as the profession transitions into a back pain care model. 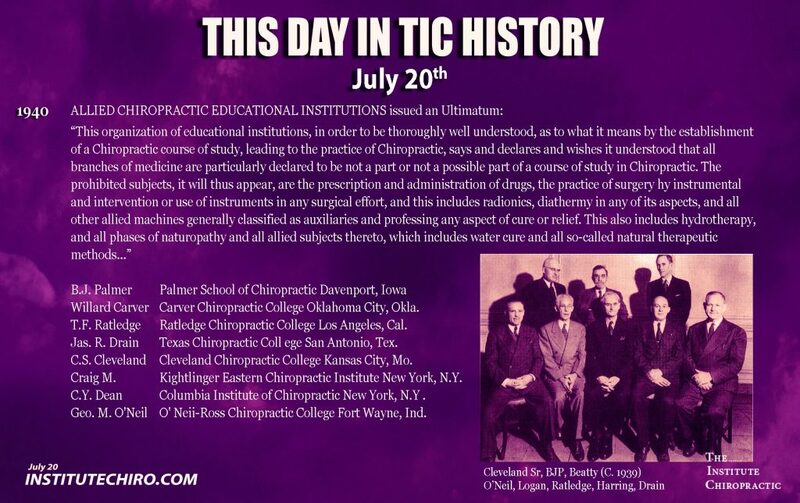 Many chiropractic schools worldwide are not teaching today’s students their chiropractic history, philosophy and some of its science. Today’s students may never know the unique features of their profession without having this founding education recorded by the Palmers. Chiropractic began in a healing culture that included homeopathy (eclectics), naturopathy, medical gymnastics (pilates), pharmaceuticals, orthopedics and surgery, and still people suffered chronic conditions with no hope for further help. D.D. Palmer found that adjusting the spine rebooted the human nervous system to reset and restore tissues, organs and structures where other methods had failed. With so few copies of these early books available many chiropractors may need to refocus their current practice using the information in this book. D.D. Palmer was a genius and defended the profession he founded in his 1910 thesis much to the dislike of those who misunderstood or misused his work. B.J. 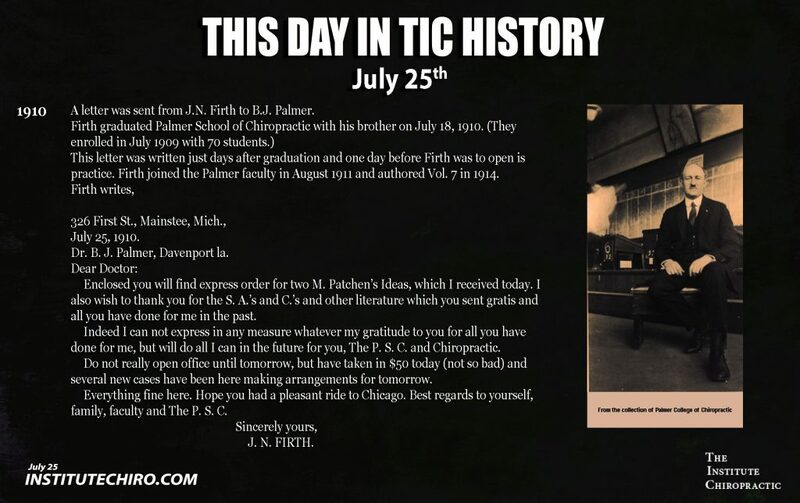 Palmer carried the flame and continued to defend his father’s work until 1961. He added new methods of analysis and adjustment as described in these books. Today’s chiropractors risk having a profession by name only without knowing its foundations as recorded by its founders. Drs. Faulkner, Foley, and Senzon have narrowed that gap with this work. I encourage every chiropractor to study this book and reclaim their heritage by developing their own collection of chiropractic history. DC (PCC), DNBCE, DIBAK, MAppSc. 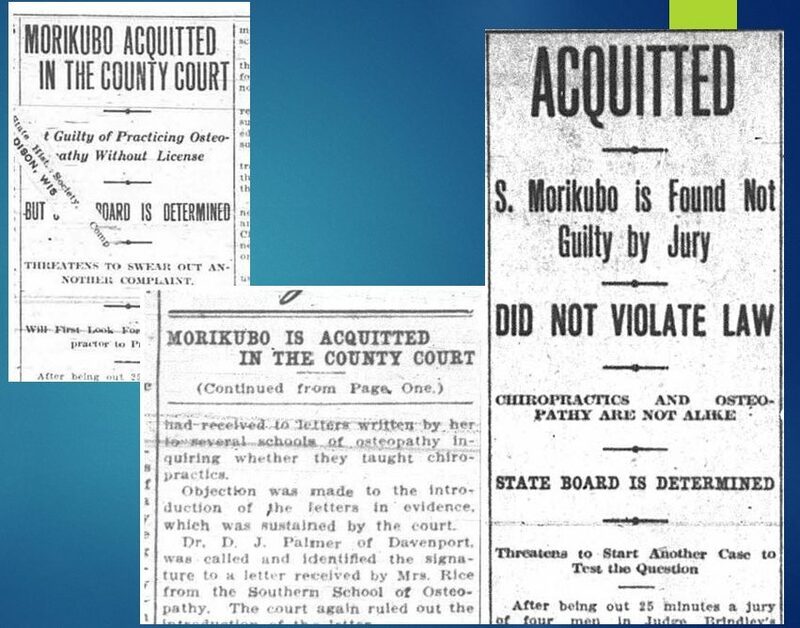 The latest lecture series posted for TIC Members includes an historical context for the landmark Morikubo trial. 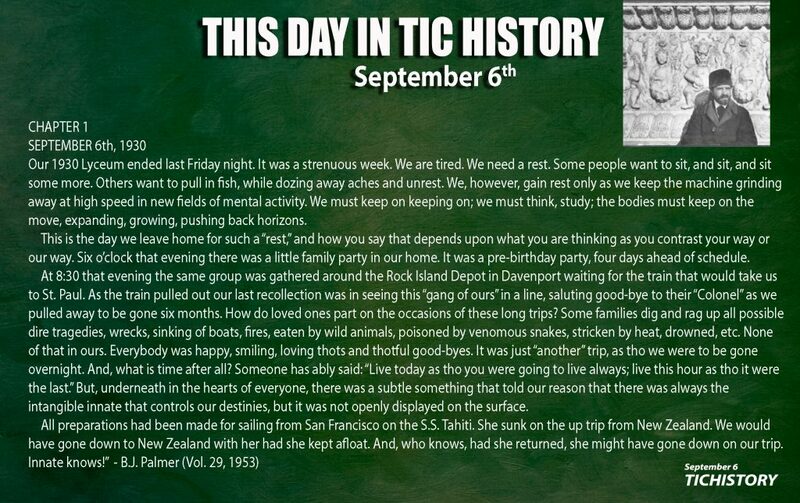 The lecture titled The Impact of the Rehm Paper builds upon the first TIC Wiki entry. The talk expands the methodologies utilized through which to critique the Rehm paper and study its extraordinary impact on the profession. A preliminary examination of the impact has begun. 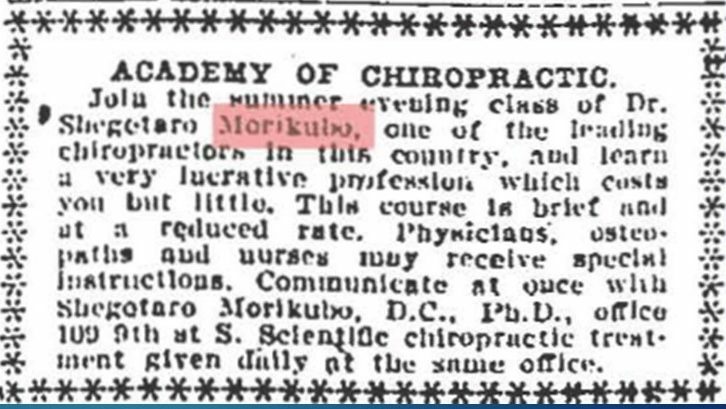 It suggests that the Rehm paper falsely claimed that the Morikubo trial was true start of philosophy in chiropractic. This untrue claim has been magnified through discourse chains in the literature over the course of thirty years. 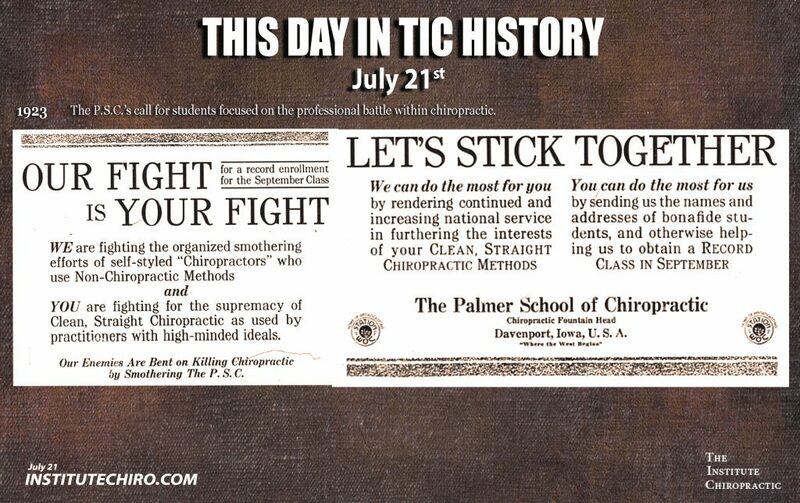 The headlines from The Chronicle of Chiropractic are one way to monitor the impact this has had on the discourse. We are so thankful to Dr. David Russell for this review of Palmer Chiropractic Green Books: The Definitive Guide and to the Association for the History of Chiropractic for publishing it. It is republished here with permission. The pdf is posted below. Follow this link to read the Introduction. Copyright 2018: Timothy J. Faulkner, Joseph Foley, Simon Senzon, & Integral Altitude, Inc.
Palmer Chiropractic Green Books: The Definitive Guide is the first book to define the Green Books in detail. It includes a theoretical overview and a historical perspective. The Green Books were published between 1906 and 1966. The books are not only the philosophical, scientific, and artistic basis for the profession but also physical artifacts. The Definitive Guide provides a comprehensive list of every edition along with ways to assess rarity and value. The book is a new way to interpret these classic texts for expert and novice. 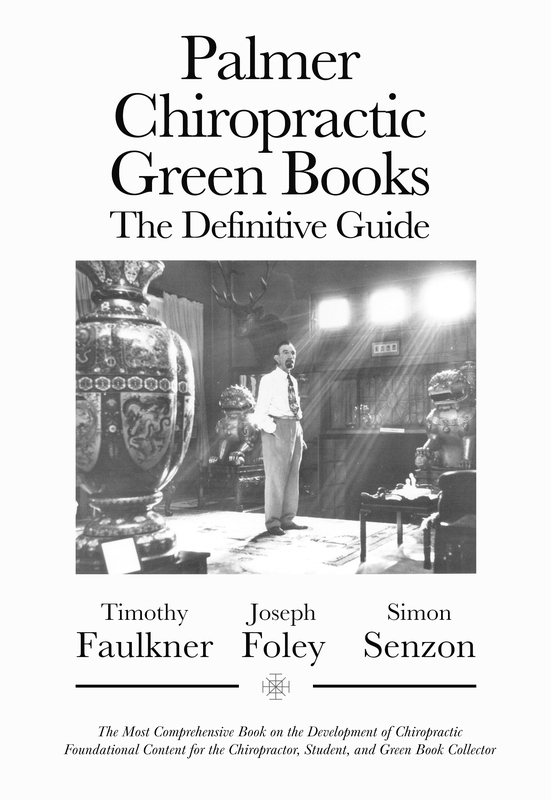 Palmer Chiropractic Green Books: The Definitive Guide by Timothy Faulkner, Joseph Foley, and Simon Senzon is an excellently presented and very important book. It is a textbook for chiropractors and chiropractic students alike, a guide for Green Book collectors, and an introduction to the original chiropractic paradigm for scholars and the public. The book provides a philosophical and theoretical overview of all 44 Green Books, written from a historical perspective. For the Green Book collector, the book includes the first definition of a Green Book, a Green Book Master List comprised of every known or suspected printing or edition, sorted into 123 Green Book Master Numbers. The book addresses many questions about the Green Books such as missing numbers in the series, duplicated numbers in the series, as well as content of each book. The Green Book overview comprises 14 chapters of the book and discusses the unique contribution of each book, without repeating many of the definitions and ideas that are common to all the books. Several new insights emerge amongst the hundreds of images, which include original advertisements for the books, such as the important role B.J. 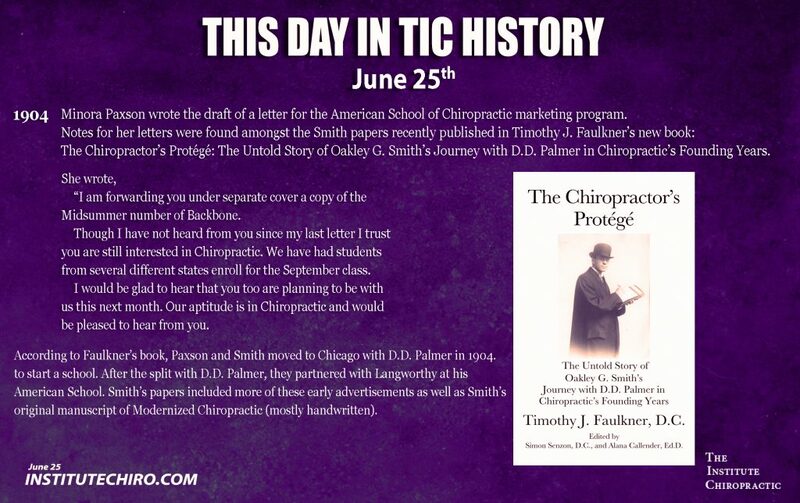 Palmer’s pamphlet series played in the books, the evolution of ideas throughout the books, the integration of the chiropractic paradigm across several disciplines taught in chiropractic education, and the final chiropractic thoughts of both D.D. and B.J. Palmer. The chapters on the Palmers are the first comprehensive examination of their complete writings. Chapters 2-4 covers D.D. Palmer’s many articles and his three books. These chapters provide the reader with the latest insights about D.D. Palmer’s most philosophical thoughts as well as his views on science, spirituality, and chiropractic practice. B.J. Palmer’s contribution to the Green Books is covered in Chapter 5 and Chapters 10-15. This is the most complete exploration of B.J.’s works ever undertaken. The chapters emphasize how his ideas develop over time in the context of his life and the profession’s evolution. The final sixteen books (Chapters 12-15) include a topical approach to his innovative views on chiropractic and philosophy. Chapters 16-18 were written for collectors, both the novice and the enthusiast. These sections include details about the Green Books as historical artifacts and collectible rarities, and in terms of their expected value. A value and rarity scale is developed along with a detailed list of every book, another first in chiropractic. Palmer Chiropractic Green Books: The Definitive Guide is important for the profession at this time. 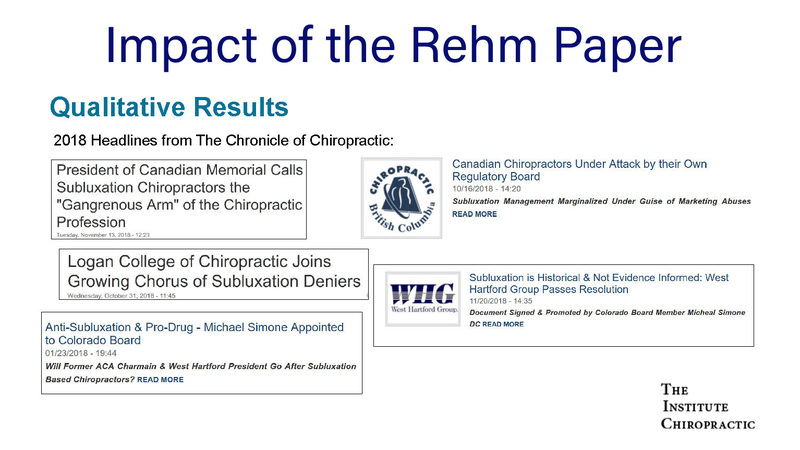 Too many articles in the literature are dismissive of the original chiropractic paradigm without demonstrating a depth of knowledge about the history and the ideas. This overview of the books offers the profession a jumping off point to refresh and renew discussions about professional identity, the value of history, and the future direction of the profession. The book also offers a way for chiropractors to anchor their own library to a long tradition of Green Book collecting and enjoy one of the pleasures of being a chiropractor. The Institute Chiropractic in 2018 was just extraordinary. Not only were we able to produce dozens of hours of new online content but we just published Palmer Chiropractic Green Books: The Definitive Guide, ten new papers were accepted on the chiropractic vertebral subluxation (1897-1997) and will be published soon, new groundbreaking research is underway, and our membership has continued to grow! Thank you for all of your support. Two new series of lectures are in development for TIC Members. Each series will be four months in length. The format will include a 20 minute lecture each week, the latest content (the new book and articles), and a robust discussion forum at TIC. The first series will focus on the Green Books and is based on the first sixteen chapters of the book. (Click here for an Introduction to the book.) 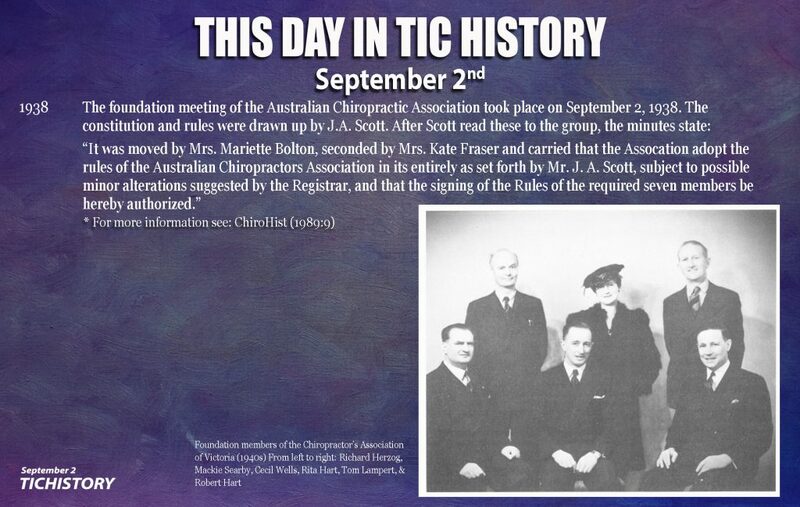 The second series includes a history of vertebral subluxation theory in chiropractic. 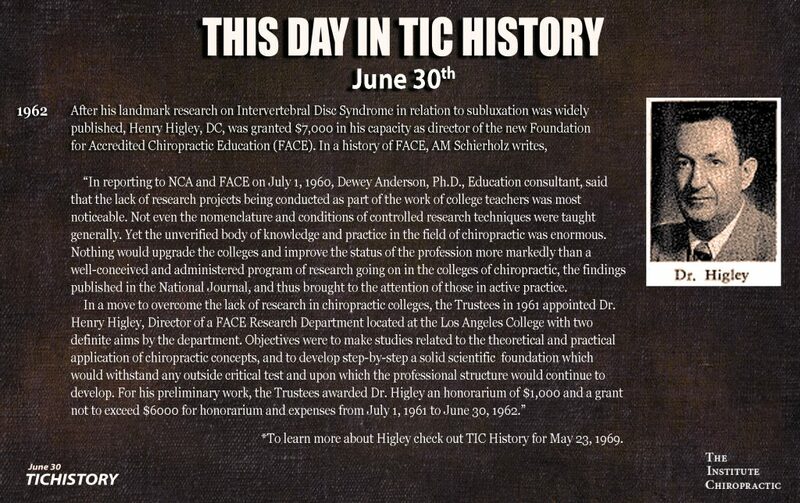 Both series will build on previous content already available at TIC and for chiropractic continuing education credit. Also this year, we will be increasing our CE offerings and giving several live talks including one of the keynote lectures at Barcelona Chiropractic College, a lecture on Innate Intelligence in the Literature at the Society for Consciousness Studies Spring conference at Yale, and a full seminar in Paris (first weekend of October). More events to be announced soon. The future looks bright for the chiropractic profession. Help us to lead the way. 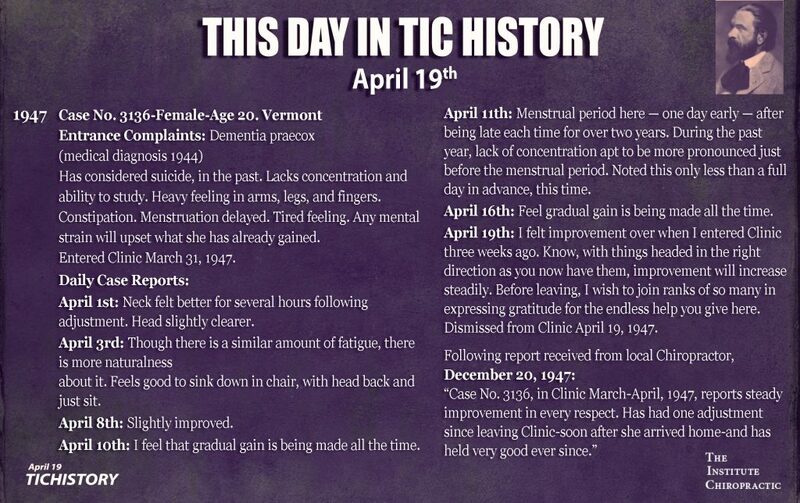 Join TIC Today! Palmer Chiropractic Green Books: The Definitive Guide by Timothy Faulkner, Joseph Foley, and Simon Senzon, is now available in color paperback and premium color hardcover editions. We decided that it was time for the chiropractic profession to have a definitive guide to the chiropractic Green Books. There are far too many myths about chiropractic’s original paradigm, the Palmers, and the Green Books. This book was designed to update the chiropractic profession about the foundation of chiropractic research, theory, and practice. The Green Books represent chiropractic’s most fundamental application. Reading The Definitive Guide is the place to start. Writing this book was a labor of love. Please order your copy today (and then order five more to gift to students). The Green Books embody the chiropractic profession’s fundamental elements. The first of the books were written by D.D. 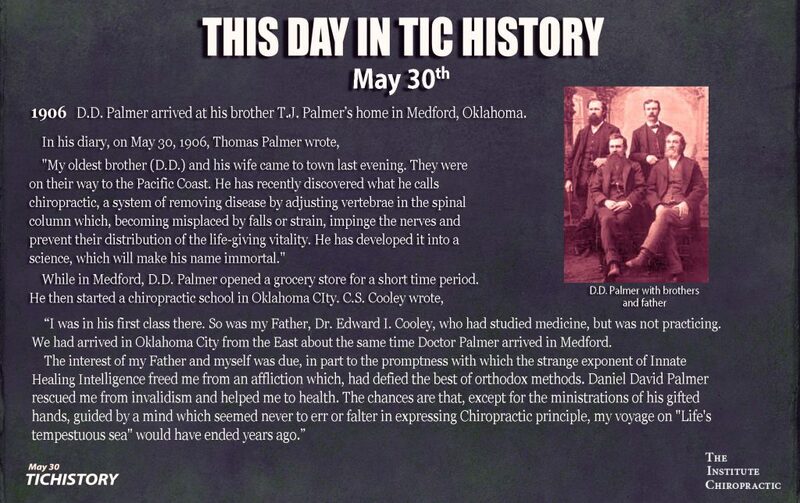 Palmer, the founder of chiropractic, and his son B.J. 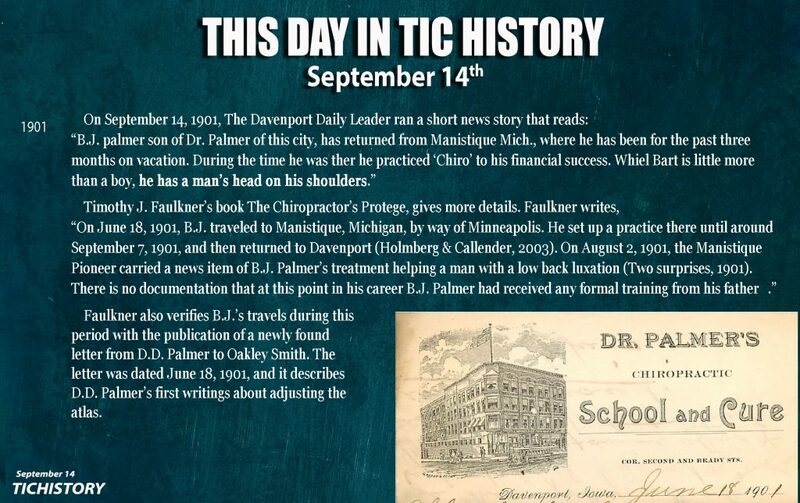 Palmer, often referred to as the developer of chiropractic. The entire series includes more than 40 books published between 1906 and 1966. Most of the books were written by B.J. and over a dozen were written by faculty of the Palmer School of Chiropractic (PSC) as teaching texts. The books themselves cover the original chiropractic paradigm, various topics viewed from the chiropractic perspective, the development of theory and ideas from the first chiropractic school, as well as a unique historical account of chiropractic events, scientific research, and the evolution of clinical methodologies over the profession’s first 60 years. 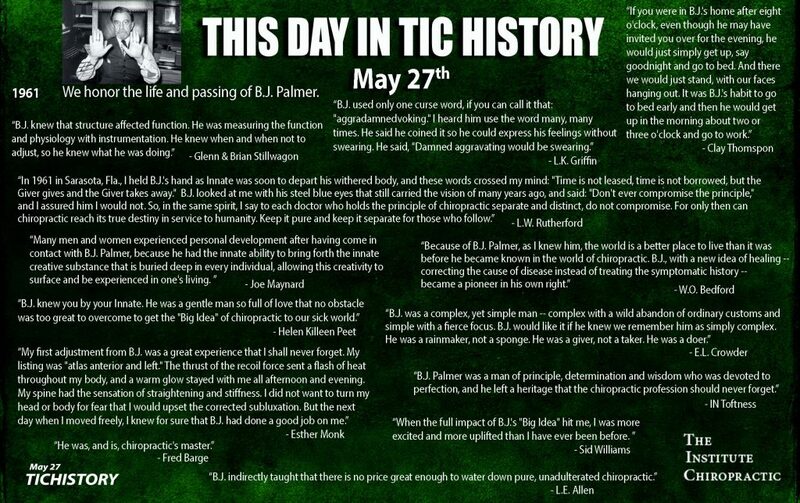 Few material items in the chiropractic profession stir up more passion and emotion than the Palmer Green Books. Some consider the books as the “alpha and omega” of the profession, with the very essence of chiropractic written within their pages. Others in the profession would like to see the Green Books burned and the Palmer ideas abandoned. For the chiropractor who chooses to practice chiropractic as it was originally developed, the Green Books are akin to sacred texts. The Green Books are original source material containing the words of the founder and the developer. For many in the profession the Green Books define what chiropractic is and what chiropractic is not. Answers to countless questions may be found within the more than 20,000 written pages. For those looking to learn about the science, art, and philosophy of chiropractic, there is but one source, the Palmer Green Books. The Definitive Guide was written as a comprehensive introduction to the Green Books. We hope it will appeal to anyone interested in the history, philosophy, science, or art of chiropractic. It could be read by chiropractic patients and practice members to better understand the foundations of chiropractic theory. 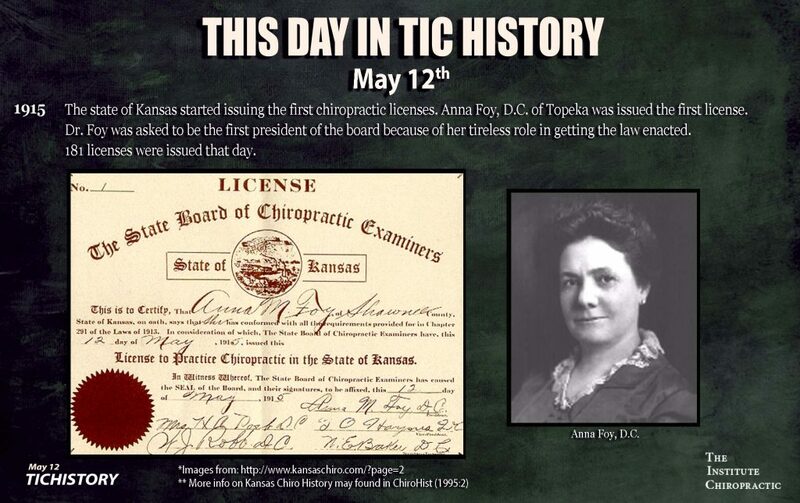 It might also be read by historians, scholars, and health care providers interested in chiropractic. Specifically, we wrote Palmer Chiropractic Green Books: The Definitive Guide for practicing chiropractors, Green Book collectors, and the chiropractors of the future. Few chiropractors have read any Green Books. Of those few, an even smaller number have read more than two or three of the books. The most commonly read Green Books are probably D.D. Palmer’s two books, B.J. Palmer’s Subluxation Specific Adjustment Specific and his Bigness of the Fellow Within, and Ralph Stephenson’s Chiropractic Textbook. Of the D.D. Palmer books it seems common for most readers to skim or selectively read passages, especially of his 1910 book, which takes a commitment to read from cover to cover. For these reasons we decided to create not only an introduction to every Green Book for beginners and collectors alike but an overview of the books. By discussing how the books developed, why they were written, and the central theories in each book, it is our hope that The Definitive Guide will become a resource for generations of chiropractors. The first fifteen chapters are about the content of the books. Most chapters cover at least two books. Some chapters include up to eight books. 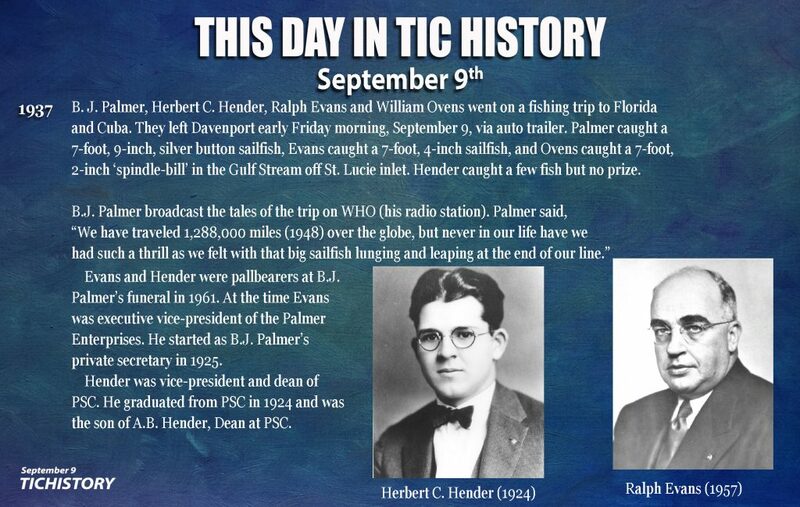 Chapter One was written as a collaboration by all three authors: Faulkner, Foley, and Senzon. 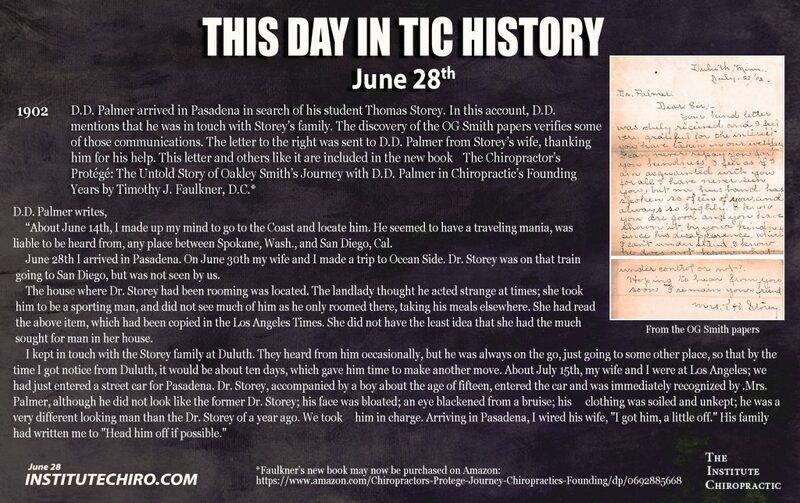 It provides a historical context for the books, how the chiropractic paradigm emerged, what the first teaching methods were like, and also some early conflicts in the profession, including the clash between D.D. Palmer and B.J. Palmer. The chapter also covers the legal pressures on the young profession and the emergence of the Chiropractic Book Series. Chapters Two through Thirteen were written by Senzon, with historical and editorial insights from Faulkner and Foley. These chapters were developed to provide the modern reader with an accurate understanding of what is in Volumes 1-39 with an emphasis on the philosophical and theoretical developments. The goal was to provide an overview not a critique. So, we’ve glossed over things like typographical or other perceived errors. Our plan was to share what the books are about. Future works might take a more critical stance and examine the many theories against current insights from philosophy and science. However, some of the chapters do offer limited critiques, contexts, and philosophical perspectives. This was necessary in order to demonstrate the relevance of the texts for today’s chiropractor. Since the focus of the book is the Green Books themselves, we chose to highlight any mention of the Green Books in advertisements, and reference within the books to the other volumes. We also highlighted quotes about the writing process and the development of the series. In a few instances, we abridged quotes with “…” to jump from one statement to another. This was done purely for aesthetics. Keeping such full quotes would have required unnecessary explanations in order to add the proper context. Readers may go to the original in such instances and read the complete text. Unfortunately, the improper use of quotes is common in the chiropractic literature, often leading to misunderstandings about the history of ideas in chiropractic. This is another reason why a thorough study of the Green Books is essential so that the development of ideas in chiropractic might be more fully understood. Also, please note that some of the language and writing style in the Green Books is unique. For example, D.D. and B.J. Palmer used shortened words, like “thot” replacing “thought.” This was a linguistic style from the early twentieth century. Additionally, both D.D. and B.J. Palmer had their own way with words. By providing extended quotes, we hope the reader might come to understand the complexity of the ideas and also develop an appreciation for the texts in a new way. Becoming acquainted with the unorthodox writing styles of the Palmers will better prepare readers for a more thorough reading of the Green Books. In addition to the emphasis on theory and the books themselves, we highlighted writings about the history and research. This focus of The Definitive Guide is important because it offers a counterbalance to trends in the current chiropractic literature that is often divorced from historical fact. For example, several of the Green Books demonstrate a robust attempt to research and document the vertebral subluxation, written from first-person accounts. Some peer-reviewed literature today takes the stance that either the subluxation was never researched or that any research from earlier eras should be dismissed. 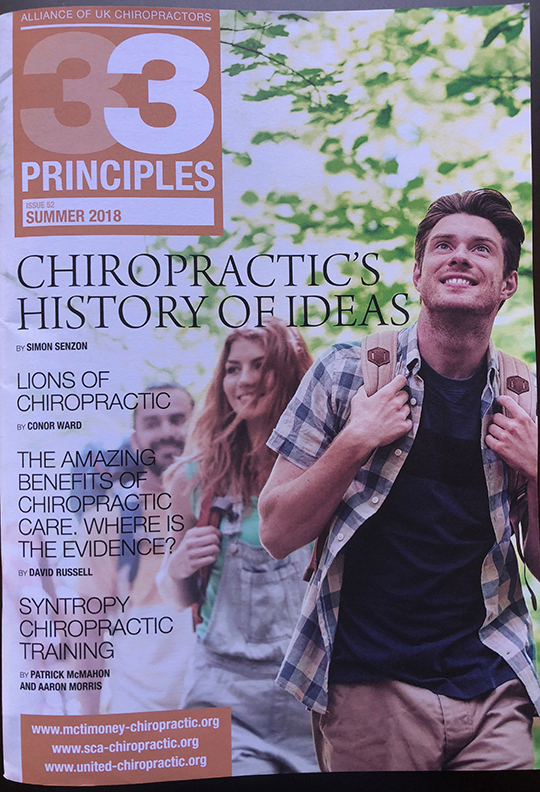 We hope that by providing a more in-depth perspective on these topics the reader might judge the value of chiropractic science based on historical fact. We have opted not to cite references throughout the text. A list of references is included at the end of the book. This was an aesthetic choice designed for the general readers and chiropractic students. We feel this way of learning about the Green Books, without being distracted by an overabundance of numbered endnotes or author’s names in parenthesis, will assist the new student of the books to focus on the ideas themselves. In that regard, we have also opted to leave out page numbers alongside each quote. All quotations are associated with each volume’s section or chapter. We expect that scholars and historians will study the references, especially if they have a question about any assertions made in the book. The overall emphasis of the first part of the book is the chronological development of ideas throughout the Green Books. In this regard, an effort was made to limit repetition. This could be misleading for the reader who hopes to get a complete overview of each book. Many of the Green Books include the same basic definitions of terms like vertebral subluxation and Innate Intelligence. Some books even repeat chapters and passages from previous books. However, each book is unique in its overall focus and development of ideas. Please assume that the core ideas are congruent throughout the books unless we refer to a distinct change from one book to another, such as the shift to an upper cervical model of vertebral subluxation or years later to a full spine analysis. So, even if one of the central concepts from the chiropractic paradigm is not mentioned in regards to a particular volume, that does not mean the book skips the topic. By emphasizing the unique contribution from each book, rather than repeating identical definitions, The Definitive Guide explores the evolution of the ideas while offering an overview of the books. In order to acquire a complete understanding of any Green Book, it is essential to go to the source and read it. Chapter Two is about D.D. 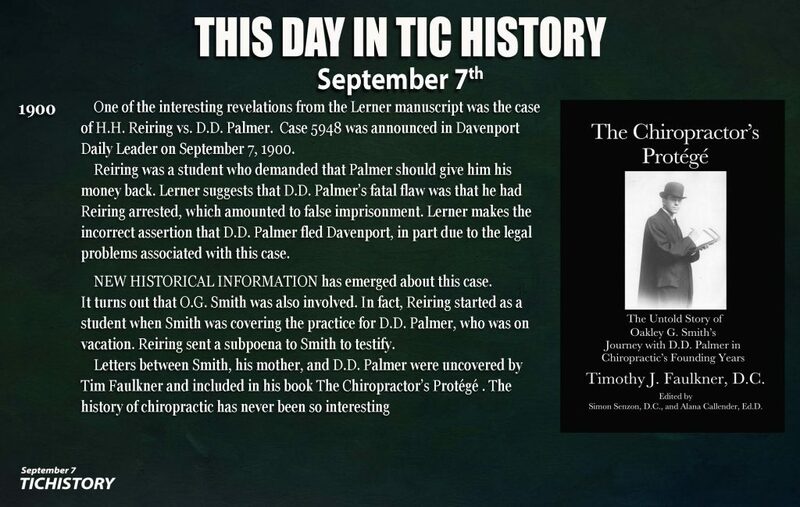 Palmer’s first writings on chiropractic, with an emphasis on his writings between 1902 and 1906. D.D. 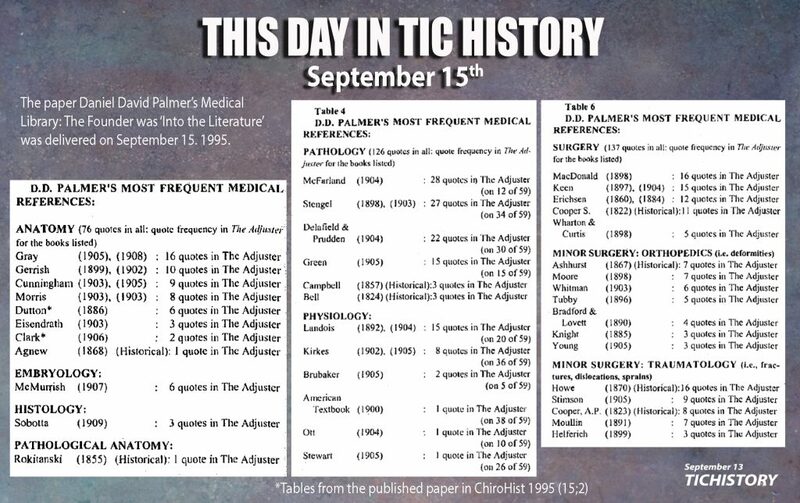 Palmer’s writings from this period laid the foundation of the chiropractic paradigm and also comprised the core chapters of Vol. 1 of the Green Book Series. 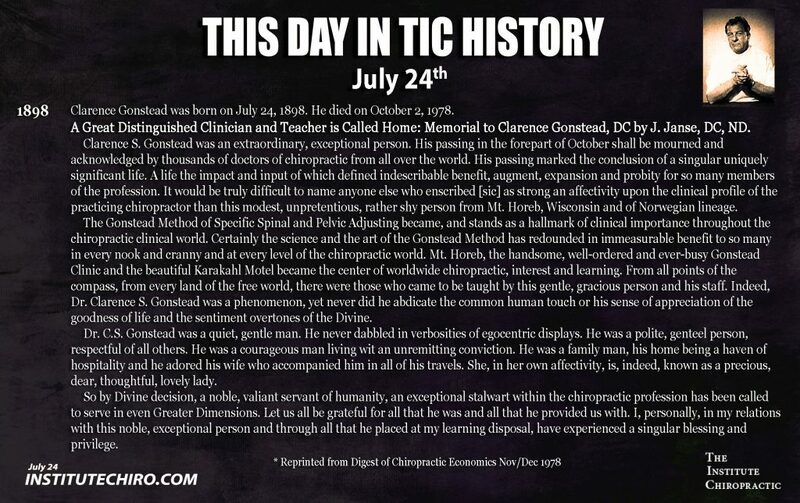 Chapter Two also includes some of the historical background of his early writings, a few references to his pre-1900 writings, as well as discussions of his earliest thoughts on disease, structure and function, mixing chiropractic, vertebral subluxation, Innate Intelligence, Educated Intelligence, and Universal Intelligence. Some of these early articles were also included in D.D. Palmer’s 1910 book. Chapter Three includes an overview of 1906-1910. This includes an historical account of how Vol. 1 ultimately got published without D.D. Palmer’s final approval, even though he was listed as the primary author. 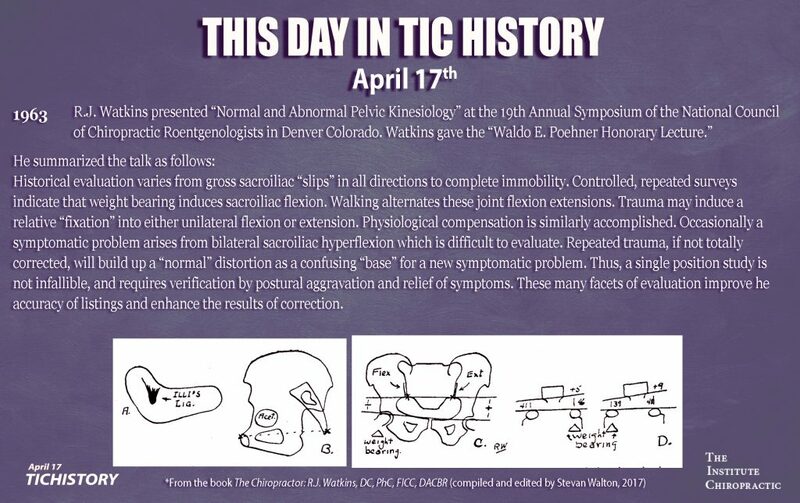 The chapter explores his 1906 theories about displaced articular surfaces and disease. The chapter also includes a chronological look at his Portland writings between 1908 and 1910, which were all included in his 1910 book. The examination of those writings emphasizes his critiques of other chiropractors, his theory of impingement, as well as his new thoughts on Innate. For example, in September 1909 he critiqued his own essay on Innate Intelligence originally written in 1903 and updated his theory. The chapter also includes a brief discussion of his 1910 book. This section emphasizes his theories that had not been significantly written about prior to 1910 such as tone and neuroskeleton. Chapters Five and Six include overviews of Vols. 2-13. These books formed the canon of the textbooks that were used to teach the first generation of chiropractic students at the PSC. Chapter Five covers B.J. Palmer’s first six books. In those books, B.J. introduced new theories and practices, some of which became the foundation of the profession for decades. His new clinical applications and philosophical contributions were developed from the paradigm initiated by his father. For example, D.D. Palmer’s practice of nerve tracing was developed into the meric system, and his theory of dis-ease and abnormal function were developed into B.J.’s models of momentum, retracing, and nine primary functions. B.J. Palmer’s models were also developed in the context of his expanding clinical empiricism. He officially took over the school from his father in 1906 even though he had been running it since 1902. 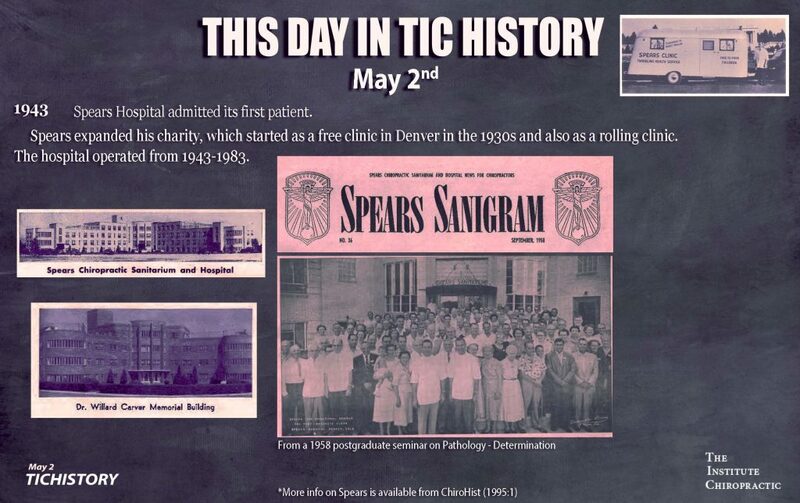 By 1909, the student clinic at PSC in Davenport was seeing more than 100 patients per day. Textbooks were needed for the growing student body, not only for philosophy and technique but for every core subject. 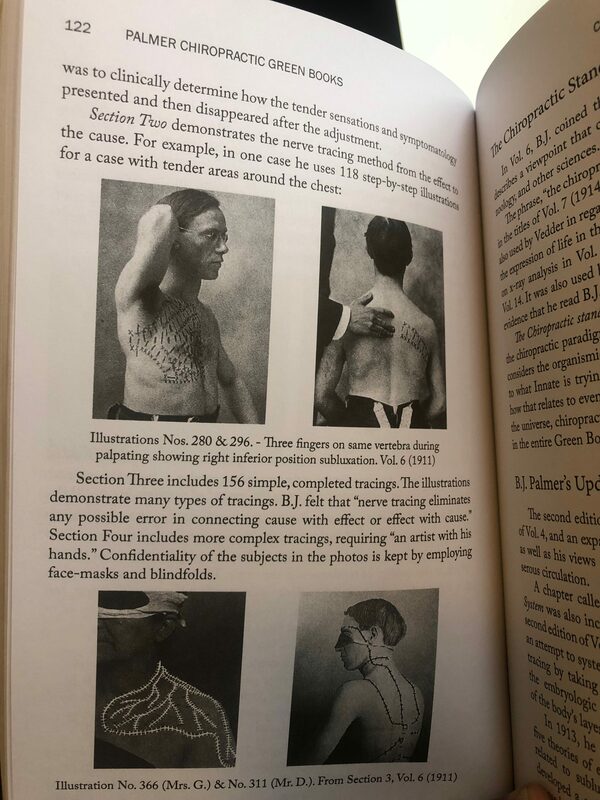 Chapter Six explores the first textbooks written by PSC faculty between 1914-1920 on topics like Symptomatology, Physiology, Anatomy, Spinography, Chemistry, and Gynecology. These first books in the PSC faculty series, which came to be known as the Green Books, demonstrate a pioneering philosophical approach to biology for the early twentieth century. The books shared a common viewpoint, the view from Innate. That is, not only did they consider the organism in terms of neurologically mediated self-organizing and self-healing processes but they tried to convey each physiological and clinical topic based on what Innate was attempting to do at any moment. This was in regard to normal function, interacting with the environment, and dealing with the consequences of vertebral subluxation. B.J. referred to this as “the chiropractic standpoint.” The early Green Books represent the first comprehensive attempt by a school of thought to publish a series of textbooks from an Innate perspective. These chiropractic texts foreshadowed late twentieth century theoretical biology with its theories of autopoiesis, complex systems, dissipative structures, and self-organization. 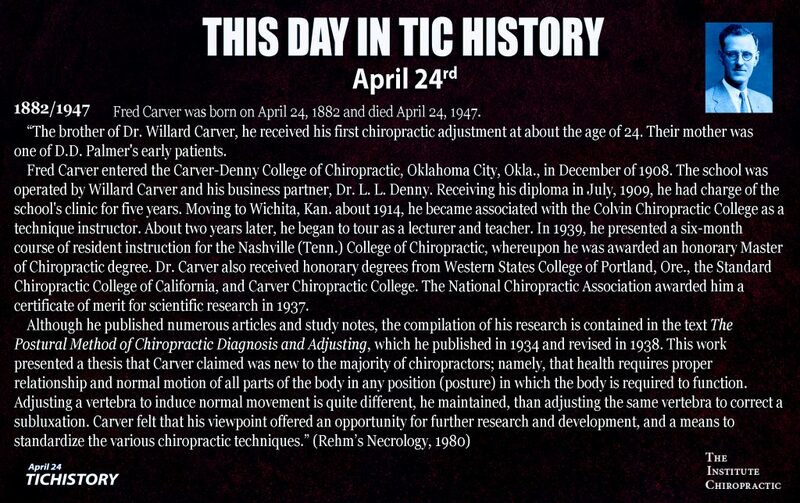 Future chiropractic research and theory might build upon this foundation by understanding the ways these early chiropractors integrated the chiropractic paradigm into each discipline. Chapters Seven, Eight, and Nine include the books published in the 1920s. Chapter Seven is about what we refer to as the Humanities Green Books: The Spirit of the PSC, Chiropractic Advertising, and Chiropractic Malpractice. The first book, The Spirit of the PSC was written as a novel by Leroy Nixon, a student, to capture the atmosphere of the school at its peak in the early 1920s. 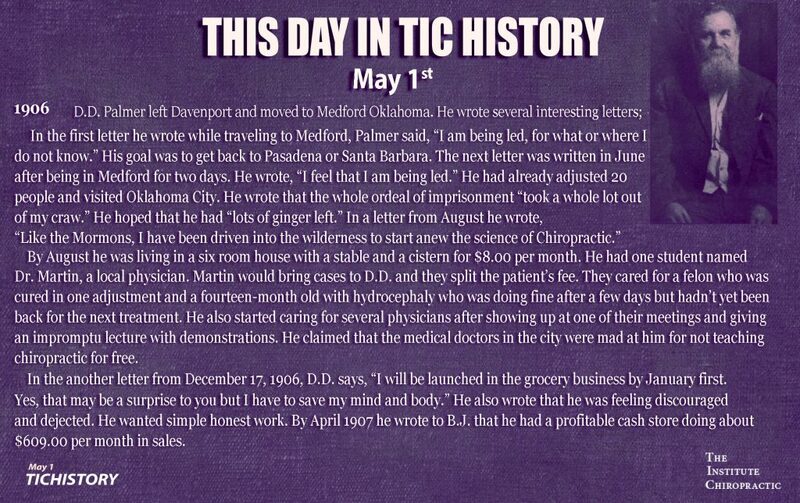 Chiropractic Advertising was written by Harry Vedder, a faculty member. It includes an overview of marketing practices in common use and also advice on communication and professionalism. 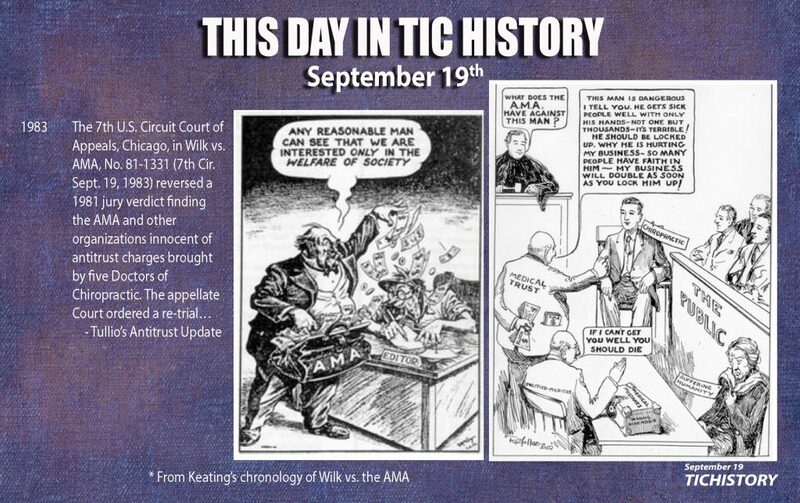 Chiropractic Malpractice was written by Arthur Holmes, one of the chief lawyers who defended chiropractors in court. It includes legal advice, communication strategies, and a legalistic perspective on chiropractic from that era. Chapter Eight covers the legacy of John H. Craven, DC. 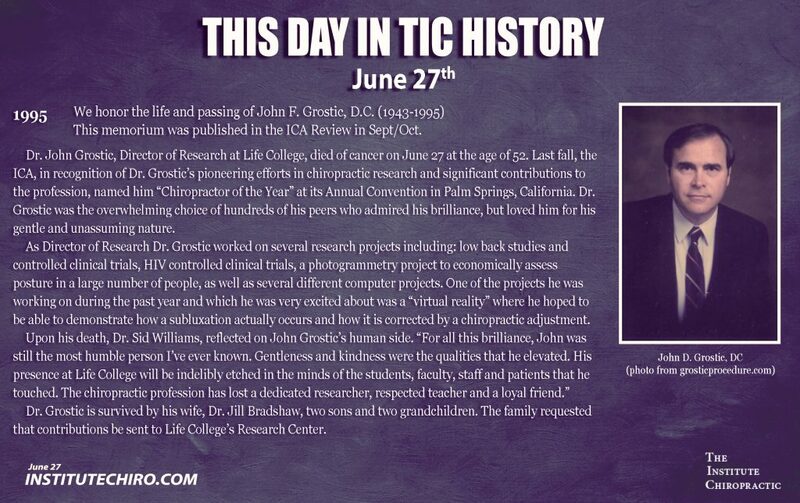 He wrote two Green Books: Chiropractic Orthopedy and A Textbook on Hygiene and Pediatrics from a Chiropractic Standpoint, and, he also collaborated with B.J. Palmer on new editions of Vols. 1, 2, and 5. Those were B.J.’s main books of philosophy. As head of the Department of Philosophy, Craven was the teacher of Ralph W. Stephenson, DC. Chapter Nine covers the life and work of R.W. 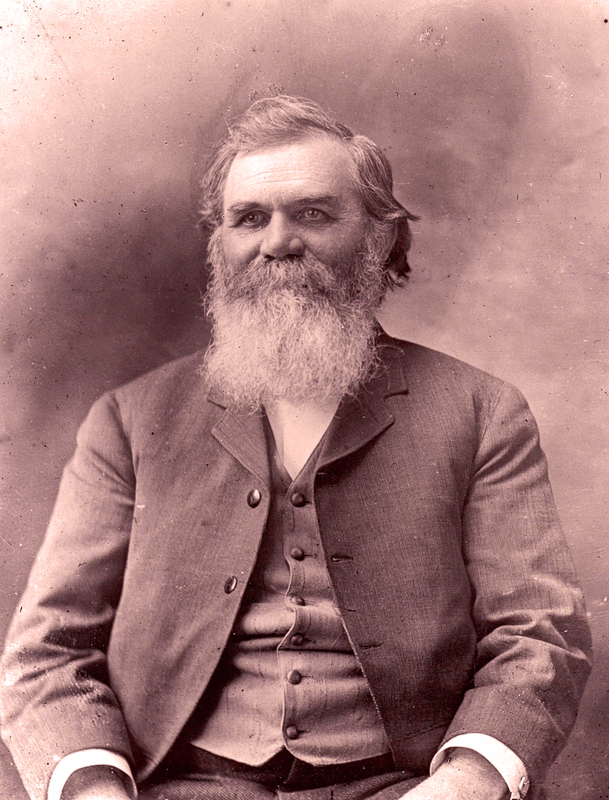 Stephenson.Stephenson’s Chiropractic Textbook has had more impact on the profession than any of the books. His 1927 book was used for decades as the main philosophy text at the PSC. 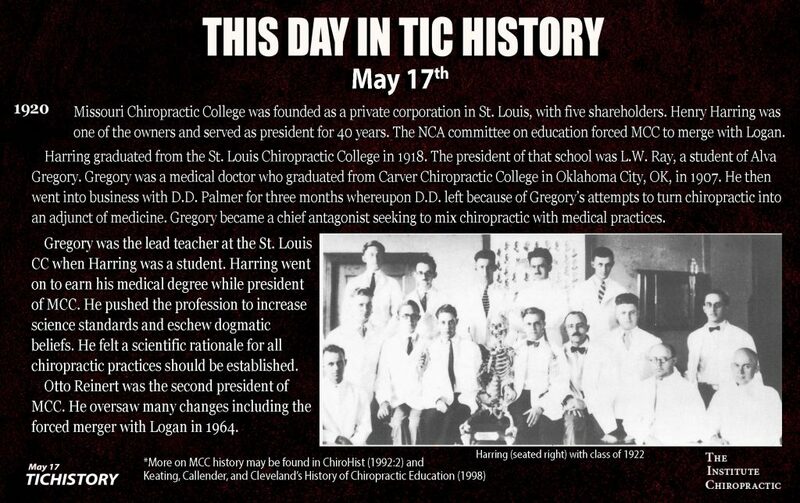 It is still used today to teach the core principles of chiropractic at several colleges around the world. 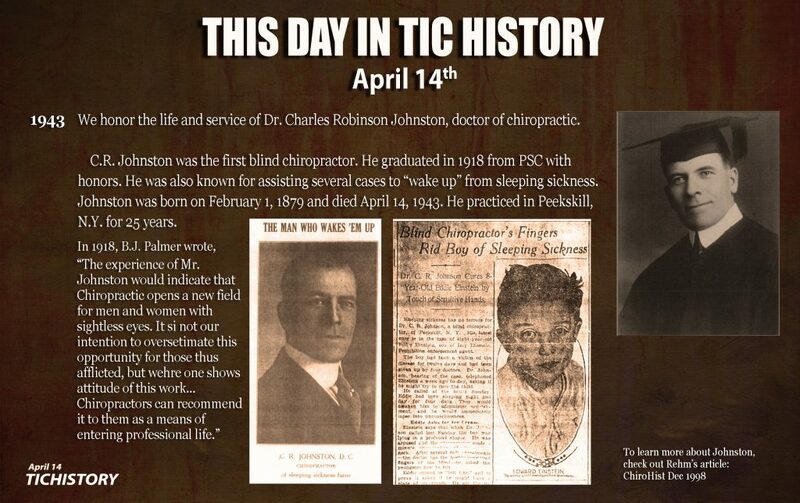 The chapter provides a look at Stephenson’s life, his writings prior to and after 1927, and also an exploration of his second book, The Art of Chiropractic. Many of the main ideas published in his textbook were already described in his articles and his thesis, written in 1924. The chapter provides a context for the book and emphasizes his contributions to chiropractic theory. Like the earlier Green Books, Stephenson’s integration of the chiropractic paradigm might be viewed as a precursor to late twentieth century theoretical biology, systems views on clinical practice, and body/mind approaches to health and healing. Additionally, his text could be viewed as contemporary for the time. What theoretical biologists refer to today as “self-organization,” the biologist of the 1920s referred to as “organization.” The Green Books used the term “organization” more than eighty times to refer to the body’s innate ability to self-organize. Stephenson refers to Innate Intelligence as the scientific “law of organization.” Understanding how the chiropractic paradigm and its development in the Green Books was a part of wider trends in biological thinking within the culture may help today’s chiropractor to find new relevance in the texts and also provide new avenues of exploration for the chiropractic researcher. 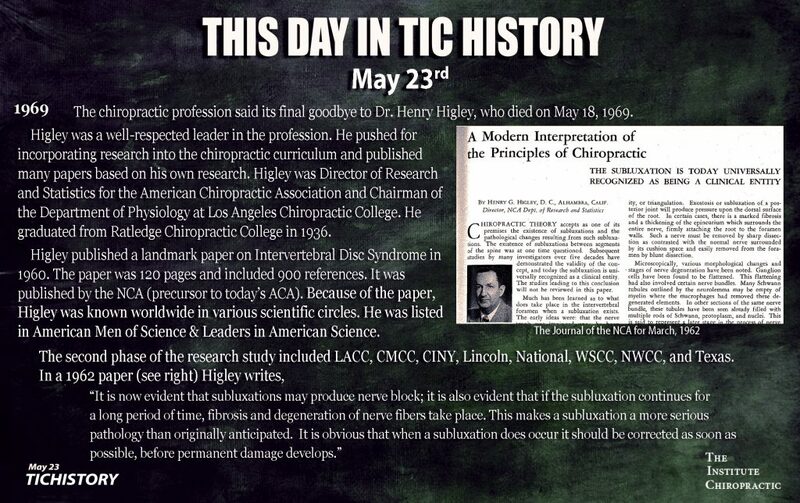 Even though Stephenson and other chiropractic theorists of that era published ideas that were congruent with early twentieth-century theoretical biologists, chiropractic texts were not integrated with main-stream health or science literature. The Green Books were mostly self-published by the PSC. 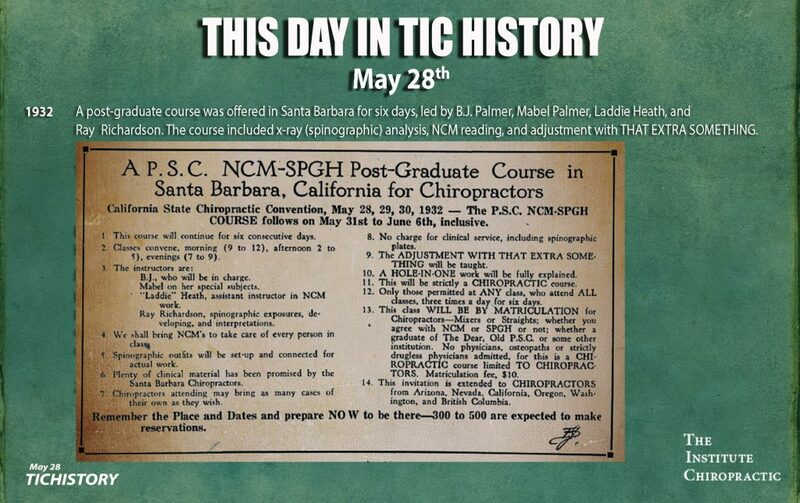 This was a common practice of chiropractic colleges, many of which published two or three texts. Chapters Ten and Eleven are about the research pamphlets and the research textbooks from the 1920s and the 1930s. Chapter Ten includes an overview of the many pamphlets B.J. 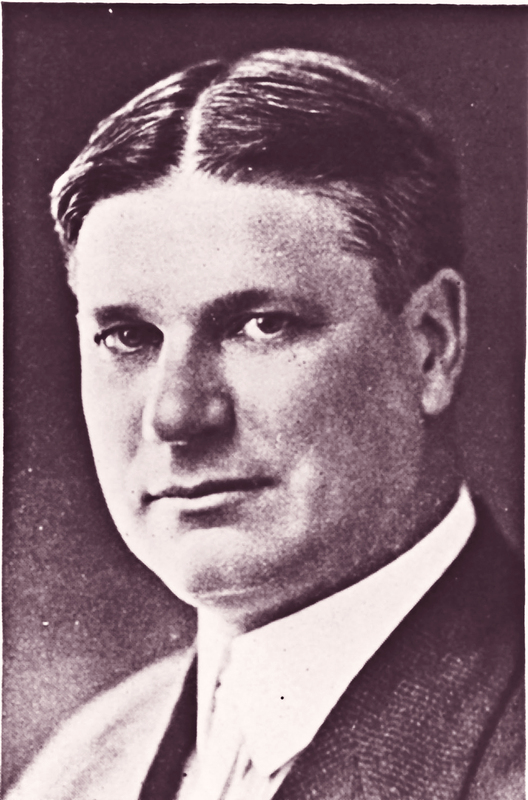 Palmer published between 1924 and 1933. 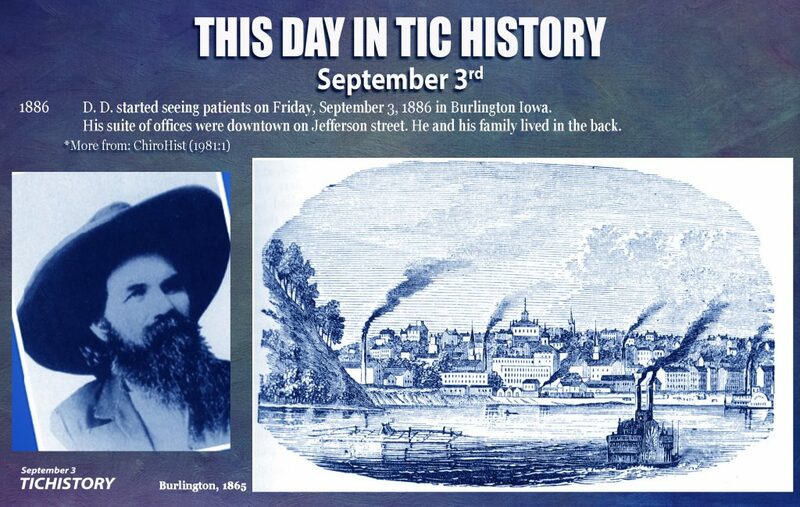 These were his yearly reports delivered at Lyceum about the various research studies undertaken, starting with the first thermography research and ending with the upper cervical model of the torqued subluxation. Most of these pamphlets were integrated into future Green Books. Chapter Eleven covers the research textbooks published between 1934 and 1938. The first book, Vol. 18, introduced B.J. Palmer’s approach to the upper cervical subluxation specific adjustment. In 1936, Vol. 19, B.J. gave his first report on the new B.J. 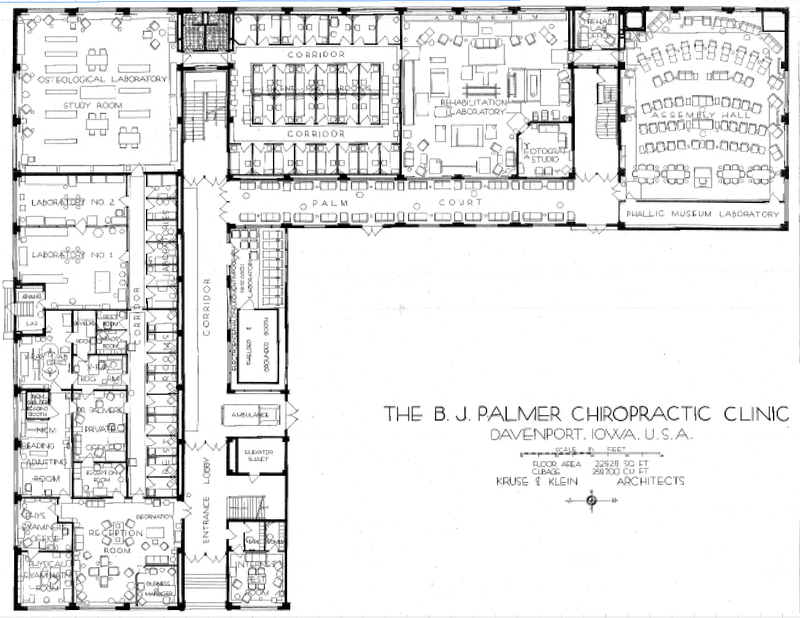 Palmer Chiropractic Research Clinic. In 1938, Vol. 20, B.J. Palmer published a text on x-ray analysis using comparative graphs and Percy Remier, DC, published Chiropractic Spinography as Vol. 21, which included the latest advances in x-ray technology and analysis. Chapter Twelve explores B.J. Palmer’s tomes. Between 1949 and 1953, he published Vols. 22-29. Each book was more than 700 pages in length. The chapter includes the main philosophical and theoretical contributions of the books along with several important details. These texts lay the foundation for B.J. Palmer’s final refinements and evolution of the Innate philosophy, including his emphasis on Innate Thot Flashes and the integration of his 14 years of clinical research using thermography, x-ray analysis, and other innovations like shielded grounded booths, and the invention of the electroencephalneuromentimpograph. The chapter also describes much of what is in the books including letters, research studies, older philosophy essays, as well as historical and autobiographical accounts. Additionally, until this chapter was written, there was no account in the literature of the way older pamphlets were used in later Green Books. One of the reasons why B.J. 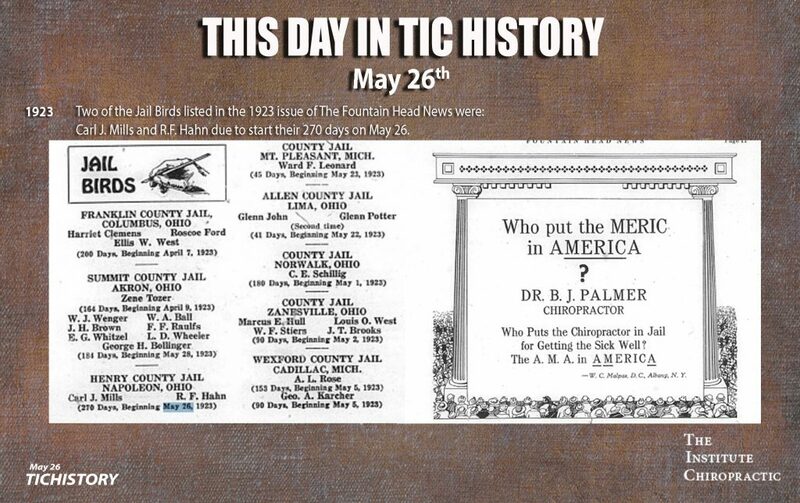 Palmer was able to publish so many thousands of pages in such a short time was because dozens of chapters are comprised of pamphlets, some of which were written as early as 1911. 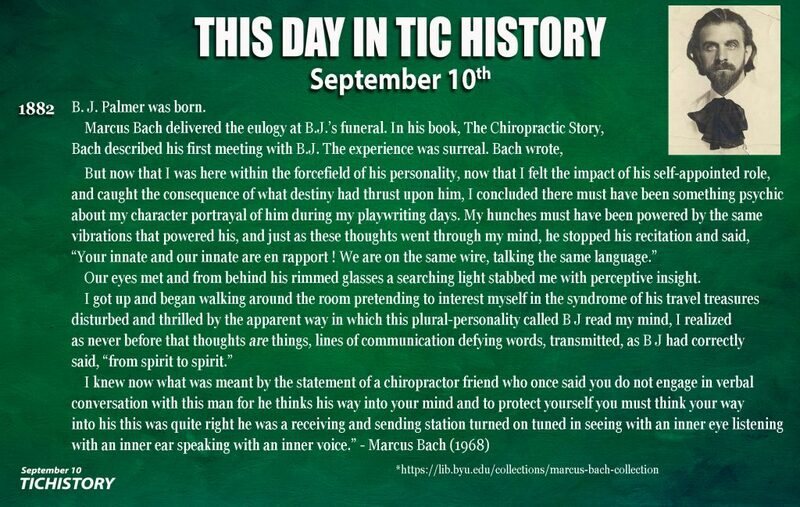 He did not include the dates for most of the original writings and so it is probable that many chiropractors have viewed these chapters as if they were written in the 1950s. The last of the Green Books convey an evolution of B.J. himself. This evolution is most notable in his more spiritual writings as well as his attitude towards critics and detractors. He became more accepting and seemed to acquire a new type of insight about human nature. He recog-nized that his audience was targeted. He wrote for them. Chapter Thirteen covers Vols. 32-34, Chapter Fourteen covers Vols. 35 and 36, and Chapter Fifteen covers Vols. 37-39. Each book represents a distinct body of knowledge. The chapter sections dedicated to each volume are categorized with topical subheadings so as to better introduce the reader to the complexity and range of ideas. The books build upon new avenues of Innate philosophy, many of which were first described in Vol. 22 published in 1949. 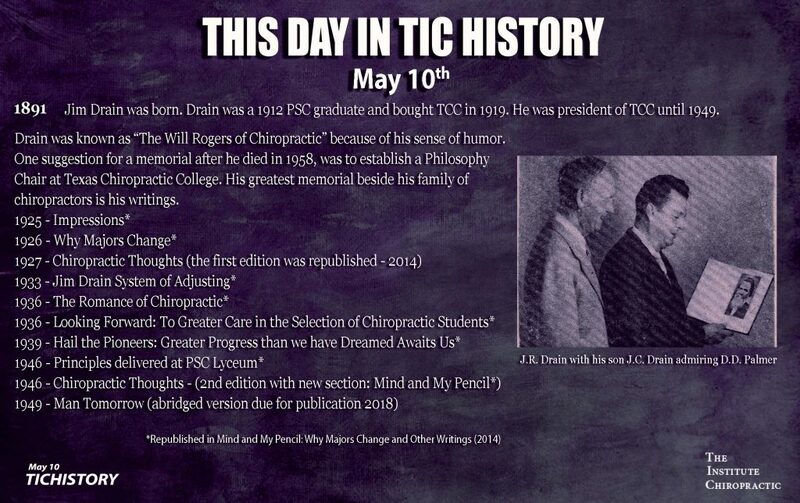 In these, his last writings, it is possible to track new developments of ideas, an evolution of theories, and a historical perspective that brings context to chiropractic as a profession. B.J. Palmer’s final eight books are an ideal place to begin any study of his life and work. The books themselves are relatively short, especially in comparison to the tomes. Any study of the Green Books could begin with Vol. 32 and, over the course of several months, systematically continue through Vol. 39. In this way, B.J. 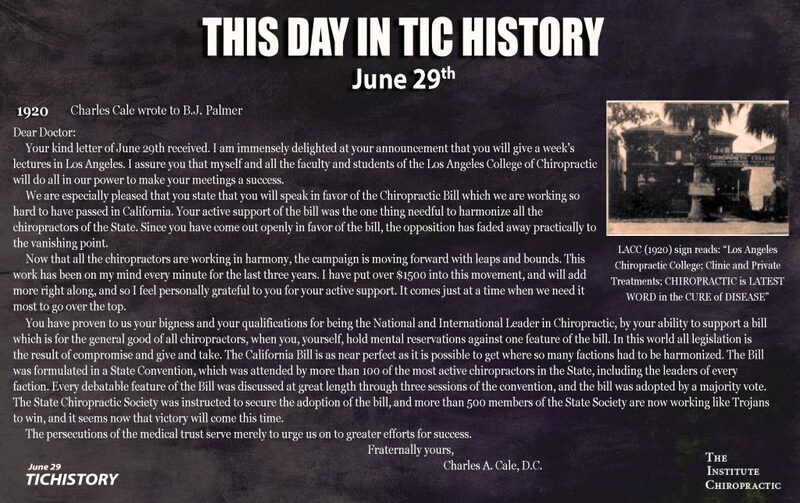 Palmer’s final writings offer any student of chiropractic an excellent place to get started. These books provide a glimpse into a life of continual growth and discovery, as well as the development of theory in relation to all aspects of chiropractic. Chapters Sixteen, Seventeen, and Eighteen, were written by Faulkner and Foley, with editorial and historical insight from Senzon. These chapters were the inspiration for The Definitive Guide, which was originally intended to be a resource for Green Book collectors and gradually evolved into the current form. The detail in these chapters include the definition of a Green Book, ways to determine authenticity, rarity, and value of a book, an exploration of the history of Green Book publications, and a novel category system to distinguish between every edition of every Green Book. Generations of chiropractors have been collecting Green Books. Many chiropractors have claimed to own a complete “set” of Green Books. Usually this means they have all the books that were issued while they or their relative was a student at Palmer. It was common for Palmer graduates to keep their Green Books even after they had retired and stopped practicing. Many kept their books until they died, their Green Books meant that much to them. 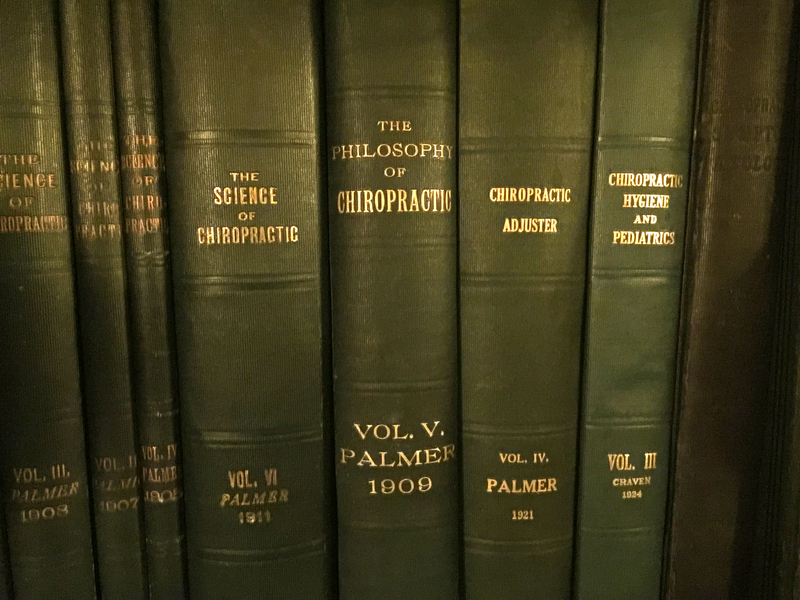 Since the Green Books were produced over a nearly sixty-year span, it is doubtful that any chiropractor was ever able to purchase each book as it was initially issued. Even B.J. Palmer could not have owned a complete set of published books because the last two Green Books were published posthumously. After B.J. 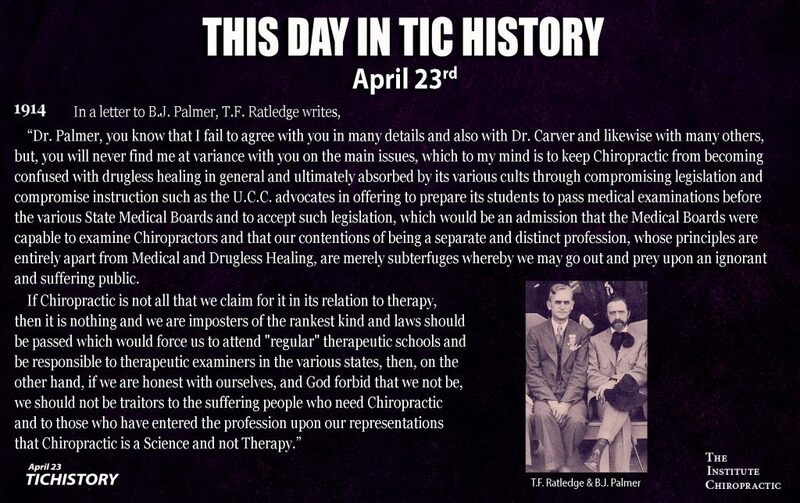 Palmer died in 1961, the profession entered a “dark age” of chiropractic philosophy. The philosophy of chiropractic was not stressed as strongly in chiropractic schools. Most of the early Green Books were long out of print. New chiropractic books discussing philosophy were rare. Young chiropractors began to search for Green Books. The authors have found small want-ads from the early 1970s, when chiropractors were seeking Green Books. One chiropractor told us that in the late 1960s and early 1970s, he advertised in the classified “wanted” section of chiropractic magazines. Generally speaking, he paid $100 for a Palmer-authored Green Book and $50 for non-Palmer books. He did not know what books existed and was always excited to find a book he did not have. Oftentimes the buyer would have to purchase all the books in a lot. He would be contacted in response to his ad by a retired doctor or the family of a deceased chiropractor. They would say they have a specific number of books and a price would be negotiated. This method led to duplicates in collections, which were often traded with other chiropractors also seeking Green Books. Some of the initial volumes from the 1920s and earlier are on their third or even fourth owners. Books from the late 1950s are just coming available because their original owners are now elderly and parting with their prized possessions. 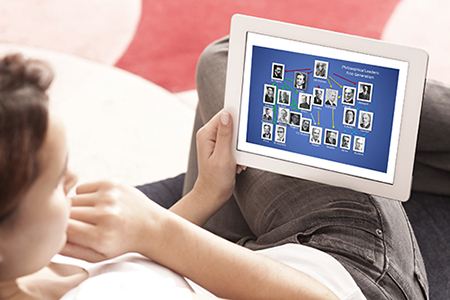 Our intent is to disseminate the most detailed knowledge available of the physical books themselves. 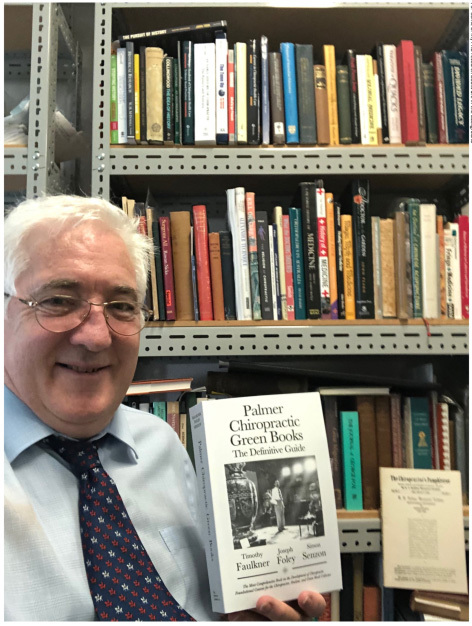 This is the first significant update to the literature about the Green Books since Glenda Wiese and Michelle Lykens published A Bibliography of the Palmer Green Books in Print, in 1986. We hope that the collector may better understand the subtle nuances of the various books and make informed collecting decisions. This book provides knowledge for the Green Book collector about the individual Green Books to be sought and offers an idea of the rarity and value. Collecting Green Books is an extension of passion for the chiropractic profession. The Wiese and Lykens bibliography introduced the profession to facts about how many Green Books were actually produced over the years. Prior to their bibliography, the only accurate lists of the books were old PSC catalogs, which listed books that were available but not books that were out of print, reissued volume numbers, or those not yet written. For example, doctors tried to collect every volume number but did not know that some numbers were used twice. Wiese and Lykens demonstrated that several volume numbers had been used on completely different books and that two volume numbers were missing from the series: Vols. 30 and 31. Their bibliography became a “shopping list” for the modern Green Book collector. It is only since their Green Book bibliography that collectors have been able to truly collect a complete set of Green Books. Chapter Sixteen covers special considerations about the Green Books such as reissued volume numbers, missing volume numbers, unnumbered Green Books, other Palmer books, covers, leather bound special editions, private collections, author mock-ups, signed and inscribed editions, numbered editions, non-traditional sized Green Books, the difference between editions and printings, supplements to editions, and modern reprints. A Green Book is any one of the books written by D.D. Palmer, B.J. Palmer or the faculty of the Palmer School of Chiropractic, for use in teaching chiropractic principles and methods. In addition, if a book was published with a volume number as part of the B.J. 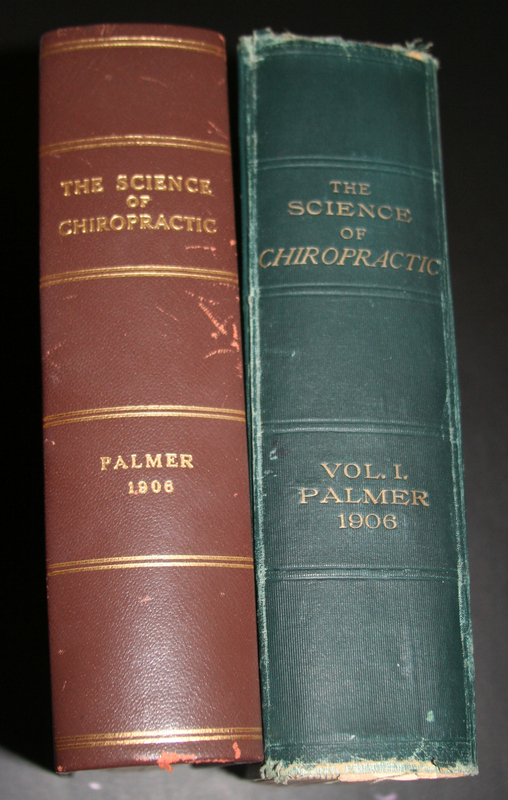 Palmer chiropractic series, all future editions are considered a Green Book even if the volume number was dropped. According to the definition, there are some Palmer-authored books, such as ‘Round the World with B.J. and Radio Salesmanship that are not considered Green Books and there are books published without volume numbers that are considered Green Books like Stephenson’s Art of Chiropractic and Pharaoh’s Correlative Chiropractic Hygiene. Chapter Seventeen introduces the new classification system called the Green Book Master List, which includes 123 books, or every edition of each book and supplement that fits within the definition of a Green Book. The entire list is included in the chapter with images of many of the books. The chapter also defines different types of sets a collector might have, which we delineate as Level 1 through 5. Chapter Eighteen covers the rarity and value of a Green Book. Since collectors traditionally did not know what books even existed, pricing was arbitrary. We will attempt to take some of the guesswork out of collecting. The chapter includes a rarity and desirability scale (also used in the Green Book Master List); how to value Green Books; the art of trading, buying, and selling Green Books, as well as how to assess book condition and guidelines for repairing damaged books. Before the Internet, finding Green Books was limited to advertising in chiropractic journals, from estate sales of deceased chiropractors, and contacting used bookstores in person. The Internet opened the inventory of every bookstore in the world to online buyers. In an instant, the inventory of thousands of used bookstores could be searched, and Green Books bought for the listed price. And yet, booksellers had no idea how to price these books. Some would be listed for only a dollar or two, others would be listed for exceptionally high prices. Green Book pricing, rarity, value, and desirability became more established with online auctions such as eBay and other auctions listing Green Books for sale. This system of buying and selling began to set a true market-price for Green Books. In an online auction, as buyers bid against each other, prices began to be established. The rarer books had serious bidding wars resulting in high prices. The more common books would sell for as low as $20 and were readily available. If there were no interested buyers, the Green Book would not sell at all. Over the past fifteen years prices have fluctuated based on supply and demand. During a period of oversupply and less demand, prices dropped. The rarer Green Books continue to command a high value. When B.J. officially took over the PSC in 1906, there were not many students. In those early years, B.J. did not need many books printed. However, he did print more books than he needed for the current students. Some books were sold to former students as well as potential students studying at home. Of course the future PSC student would need books. 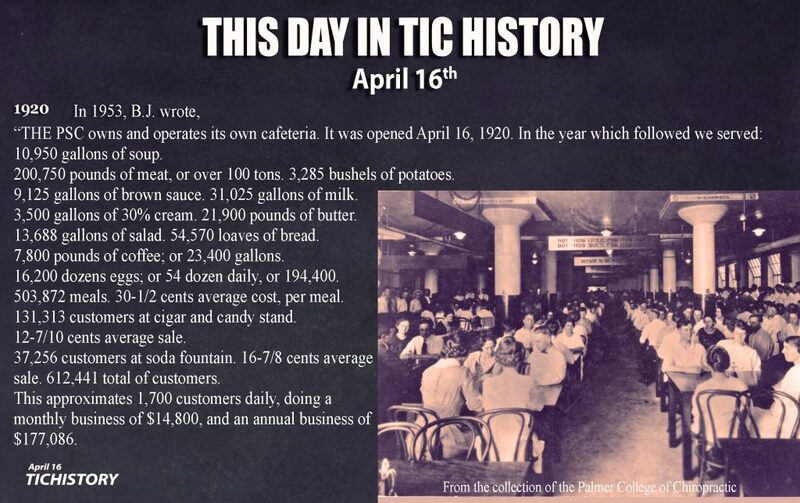 By 1919, the PSC had several thousand students. At that point many thousands of books were printed and sold by the PSC to its students. This simple detail is a big factor in the rarity of Green Book editions. Many of the early books were printed in such limited amounts that they are very rare today. Green Books for the 1920s were printed by the thousands, and as such, many have more supply than demand. The Definitive Guide was also written to act as an anchor to the chiropractic paradigm. The rhetoric in the chiropractic profession today needs such an anchor. There are articles published in the peer-reviewed literature attacking the chiropractic paradigm without adequate historical references. Some of these articles suggest that philosophy and vertebral subluxation should be dropped in the trash bin of history because they are no longer needed and perhaps never were. This type of ahistorical rhetoric, usually backed up by a plethora of circular and faulty references, is taking root in the profession and influencing board decisions, institutional policies, and threatening the ability of good chiropractors to practice. On the other end of the spectrum, philosophy is sometimes used in chiropractic to support unfounded claims, historical facts are too often mistaken, and narrowly focused beliefs limit the profession’s ability to develop. It is our fervent hope that this book will guide the next generation of chiropractors like a candle lit in the darkness. I was thrilled to be invited to write an article for the magazine 33 Principles published by the United Chiropractors Association. The article came out in the summer issue. We have posted it here with permission: Chiropractic Waves. The article covers an outline of the 8 important waves of chiropractic ideas. The waves are also featured at The Institute Chiropractic. The chiropractic waves of philosophy are as follows: First Wave (1897-1907), Second Wave (1908-1915), Third Wave (1916-1927), Fourth Wave (1928-1948), Fifth Wave (1949-1961), Sixth Wave (1962-1975), Seventh Wave (1976-1996), and the Eighth Wave (1997-2017). The waves are one way to organize the complex history of ideas in chiropractic according to philosophical contribution. Another way is according to generation. References to the article may be found here: Refs. 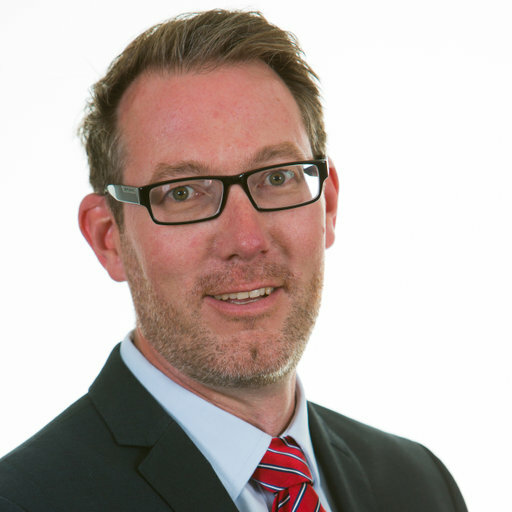 In an update from Dr. Ross McDonald, chair of The Scotland College of Chiropractic Charitable Trust, the latest projects and support for SCC were unveiled. The Board is actively developing the program and planning to meet the highest standards. Support for the new college continues to roll in. Several groups have made donations. Also, the Delta Sigma Chi organization and The Institute Chiropractic have pledged donations of books. The Delts will generously provide a set of Green Books. At TIC, we will be donating a set of White Books (we are just waiting for our newest books to be published so that their set is the most complete.) The Board is actively seeking donations to develop an osteological collection of human spines. 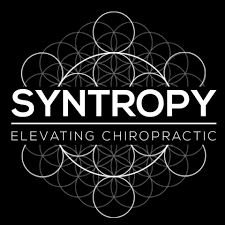 The magazine also included an introduction to Syntropy Chiropractic Training (SCT) developed by Dr. Patrick McMahon (TIC Member) and Dr. Aaron Morris. Their vision for training chiropractors to adjust with mastery is powerful. In order to deal with the issues of burn out, poor results, and low referrals, they decided to teach fundamental skills based on their backgrounds in martial arts, exercise physiology, neurology, biomechanics, advanced athletic training, and chiropractic. Another gem from this issue is a four page article by Dr. Dave Russell (TIC Member) on how to write a case study. In the article Dr. Russell provides a template for chiropractors to contribute to the literature and build the evidence base by writing case reports. He emphasizes that everyone can do it. All that you need to get started is a patient that has had positive outcomes from the correction of vertebral subluxation. Outcomes could be anything from musculoskeletal changes to emotional and psychological wellbeing improvements. Cases don’t have to be miracles to make a good case report. The keys to documenting any case are: detailed history and notes both subjective and objective and at least one progress evaluation. The more data you collect, the stronger the report will likely be. He suggests that you can set up your practice so that case reports become a regular way for you to document evidence and contribute to the literature. He also includes some tips on how to actually write the report as well as a list of journals that publish case reports. Other excellent resources on case reports include McCoy’s manual on the topic: The Case Study Report, and a two hour course available for TIC Members: How to Write a Case Report.